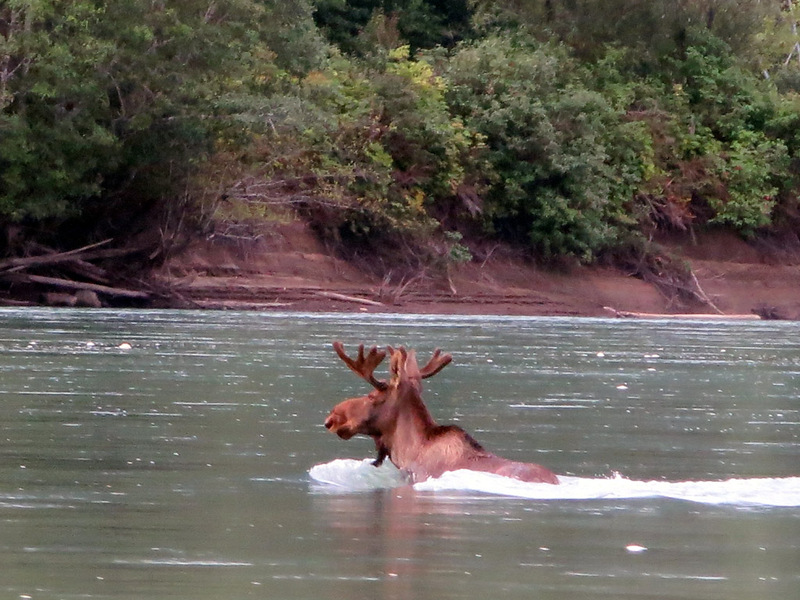 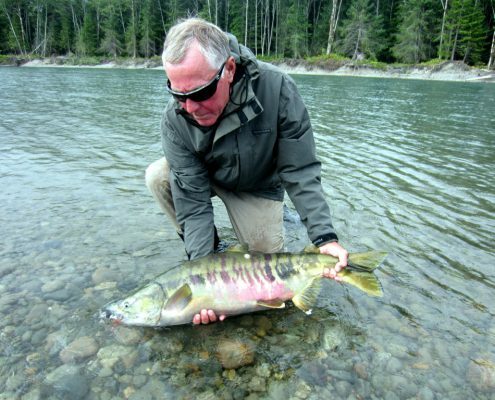 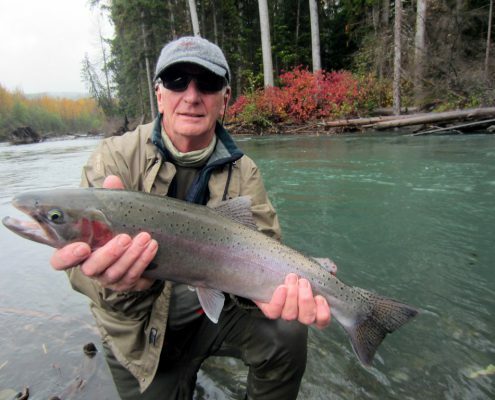 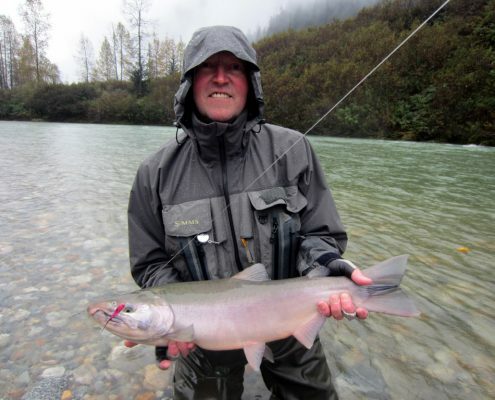 Despite a week of heavy rain, Kalum River Lodge guests had some very successful days. 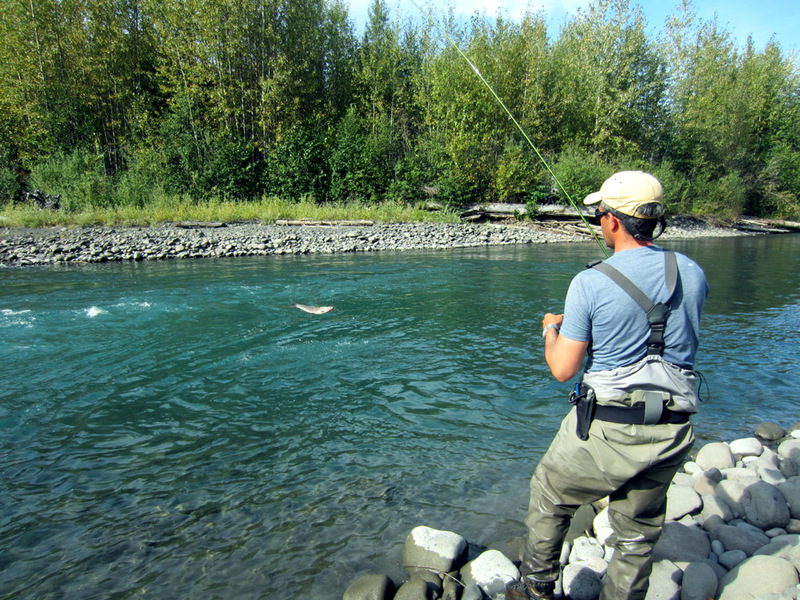 This time of year we fish more than a dozen different rivers giving our anglers a unique experience. 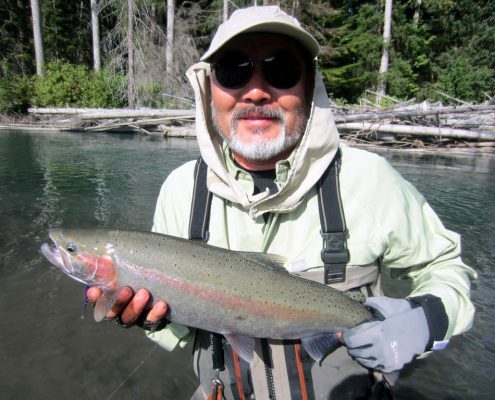 The diversity of rivers provides our guests with the opportunity to fish large rivers right down to small streams for Steelhead, Coho and trout. 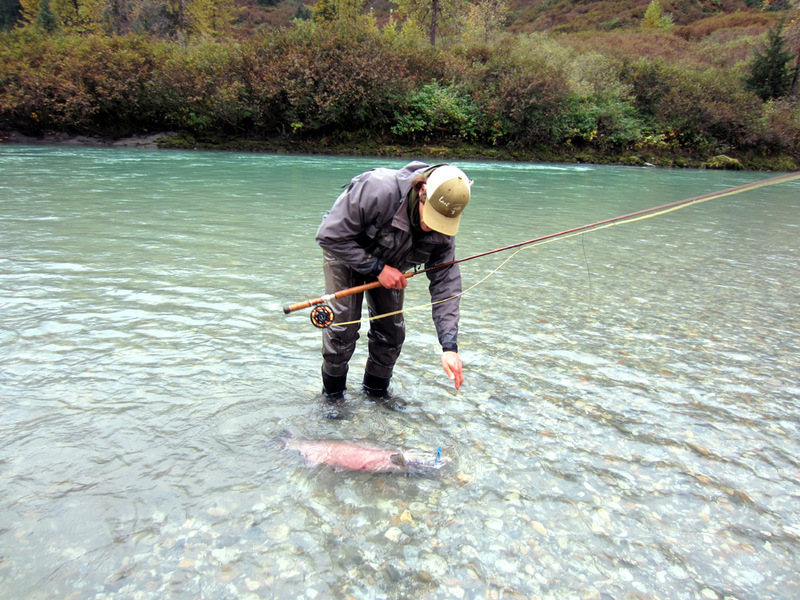 This was our last guided trip of the season. 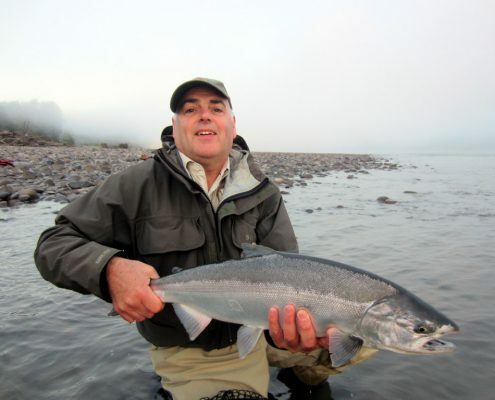 Thank you Stephen, Graham and Neil for making our last week so enjoyable. 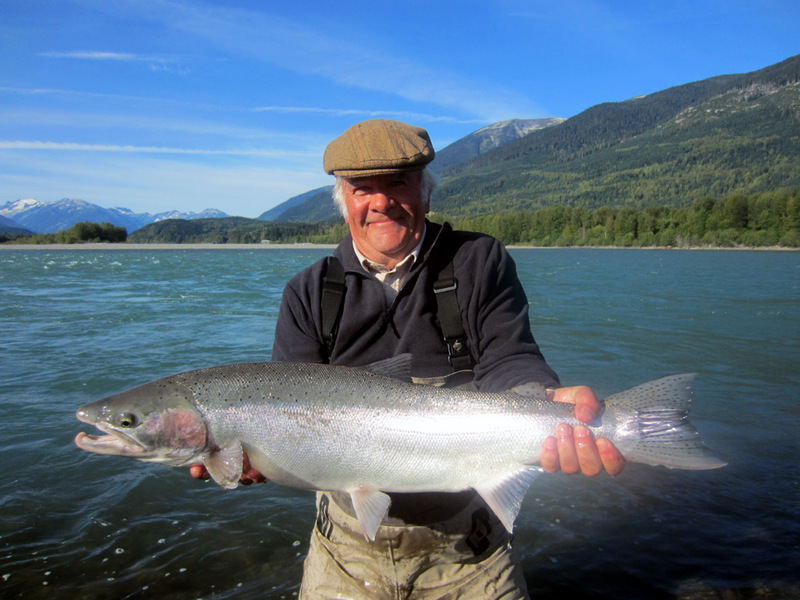 We would also like to thank all our guests who joined us for the 2014 season and we look forward to seeing many of you back again next year. 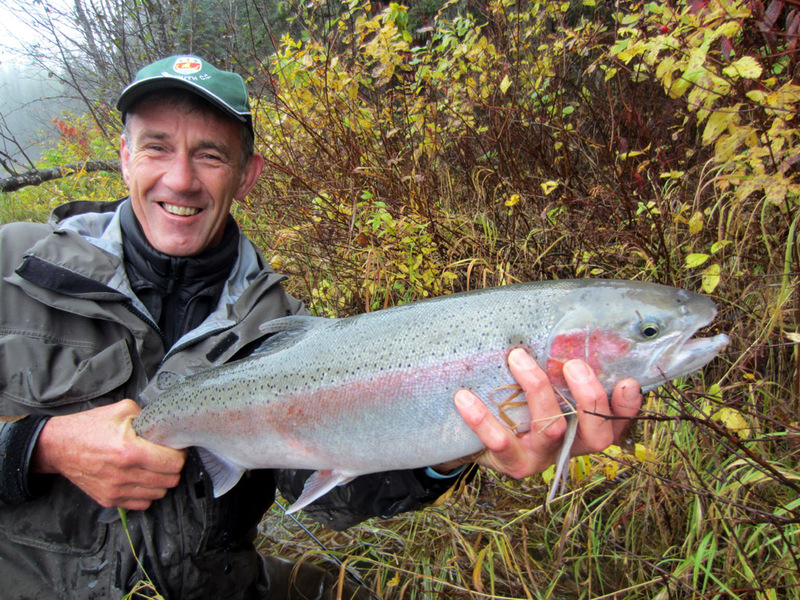 Our autumn fishing is in full swing. 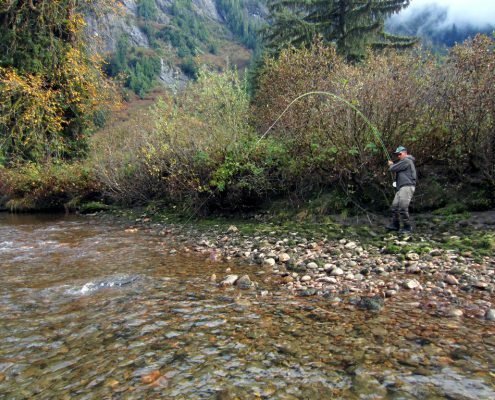 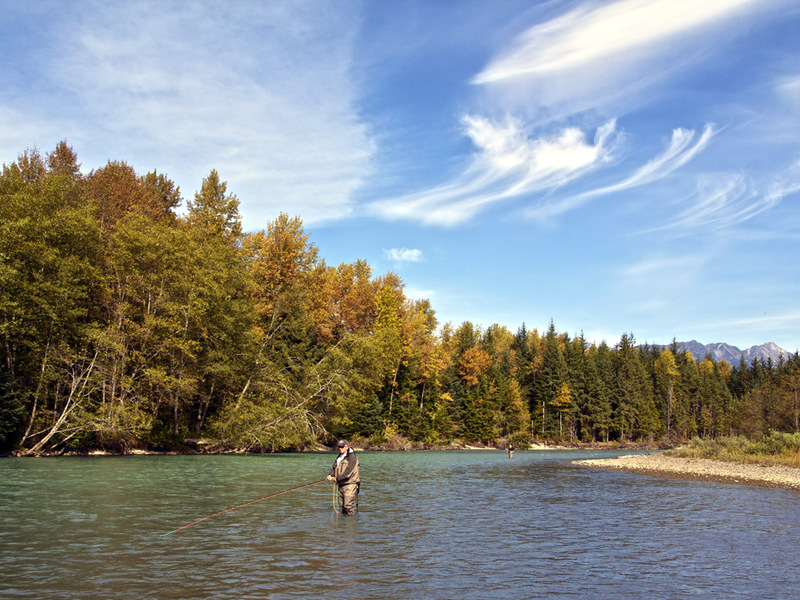 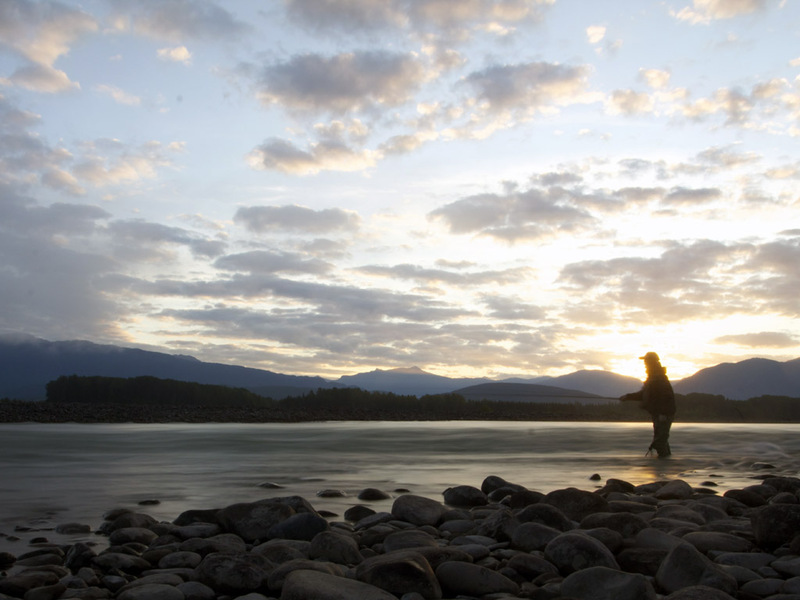 Wilderness rivers, breathtaking scenery, stunning fall colours and great fishing for Coho, Steelhead, Cutthroat trout and Dolly Varden make this a special time of the year. 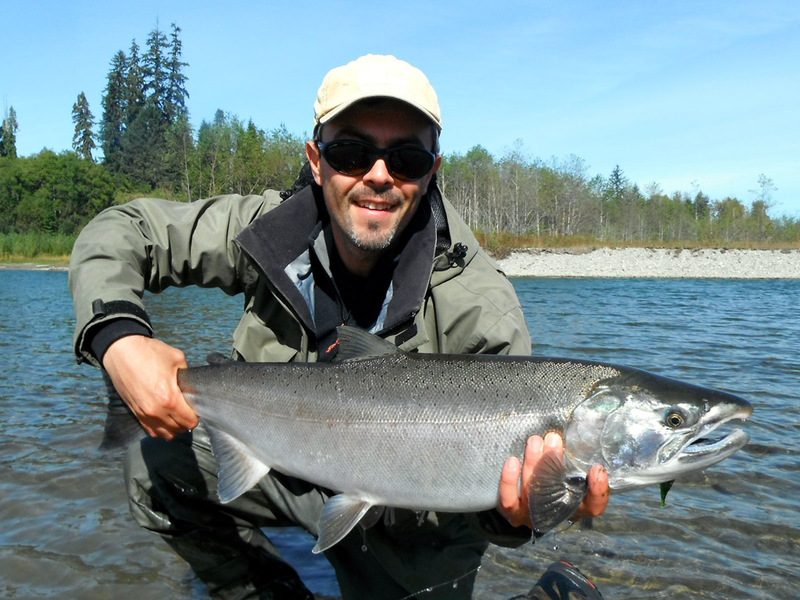 Today we were fishing on one of our favourite Coho rivers and these are just a few of the fish we landed. 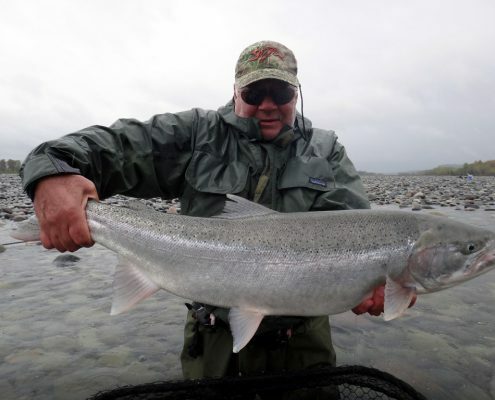 The fantastic fishing has continued. 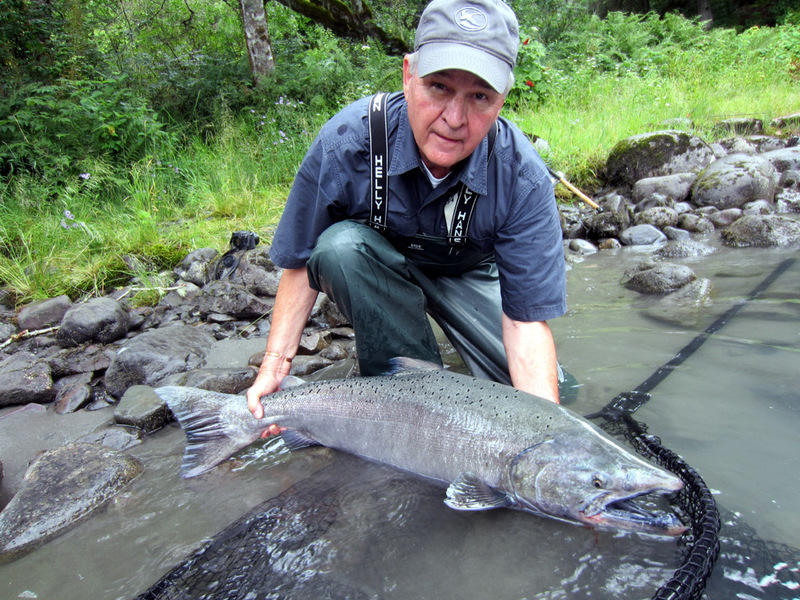 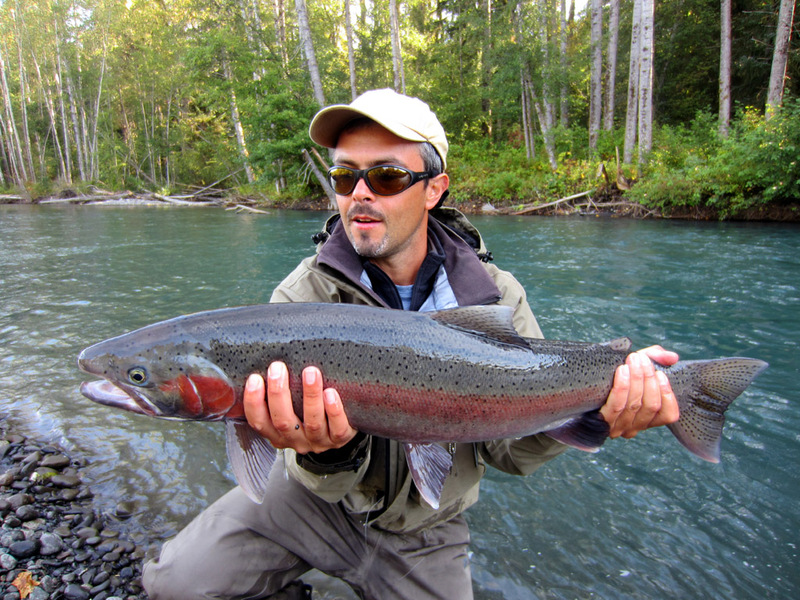 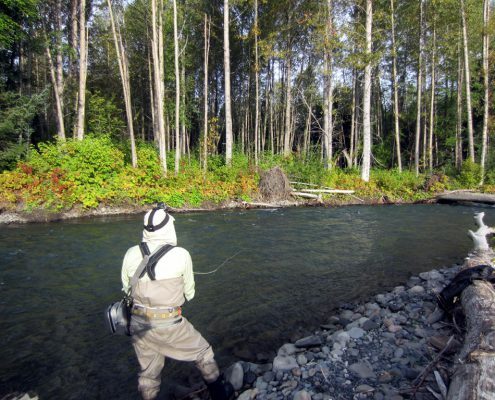 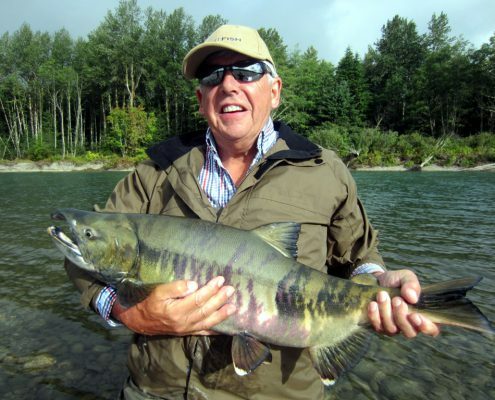 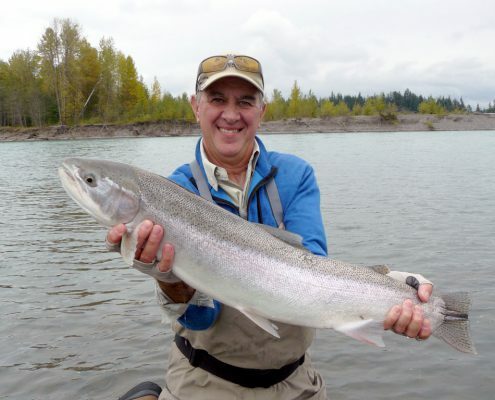 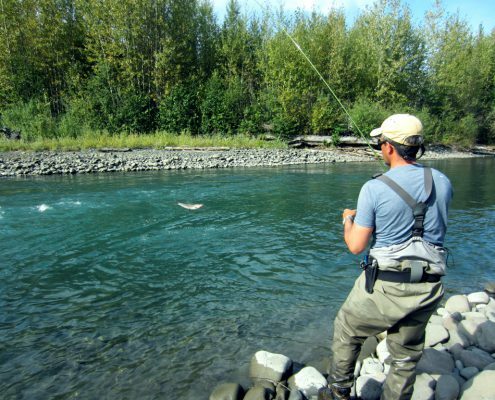 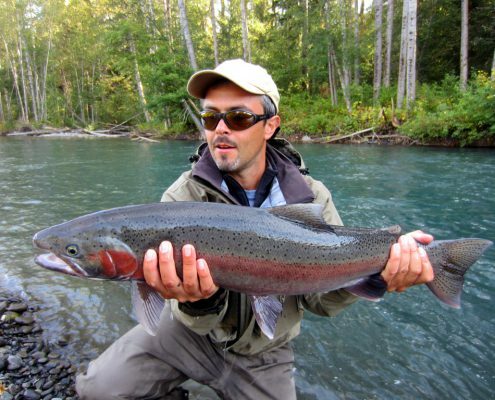 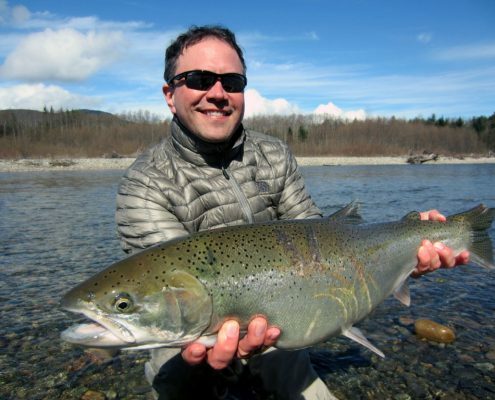 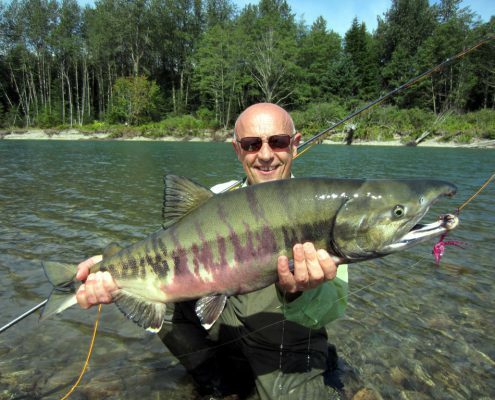 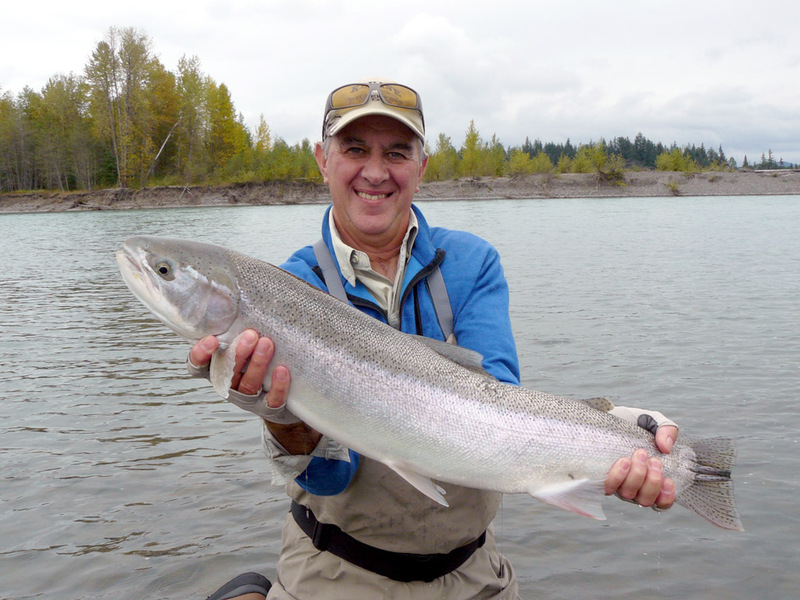 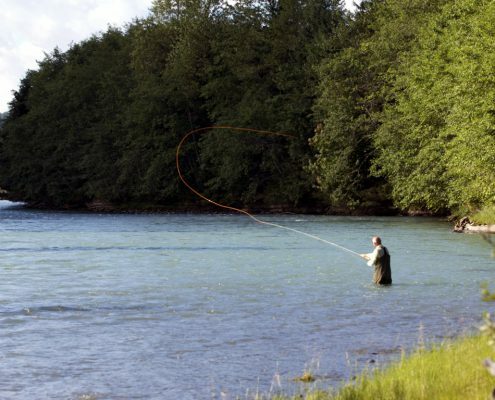 This is a great time of year to fish a variety of salmon and Steelhead rivers. 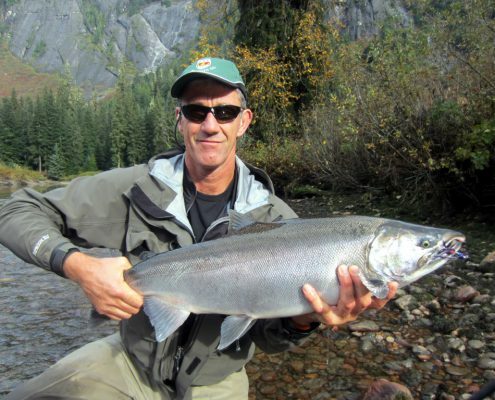 Returning guests Allan Shephard and friends enjoyed some excellent fishing, landing Coho, Steelhead and trout. 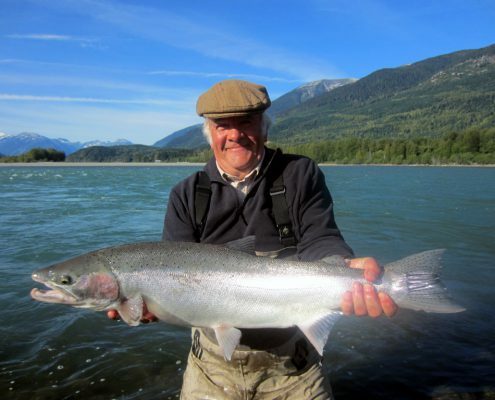 On their last day Phil landed a huge Steelhead weighing in at 24lb. 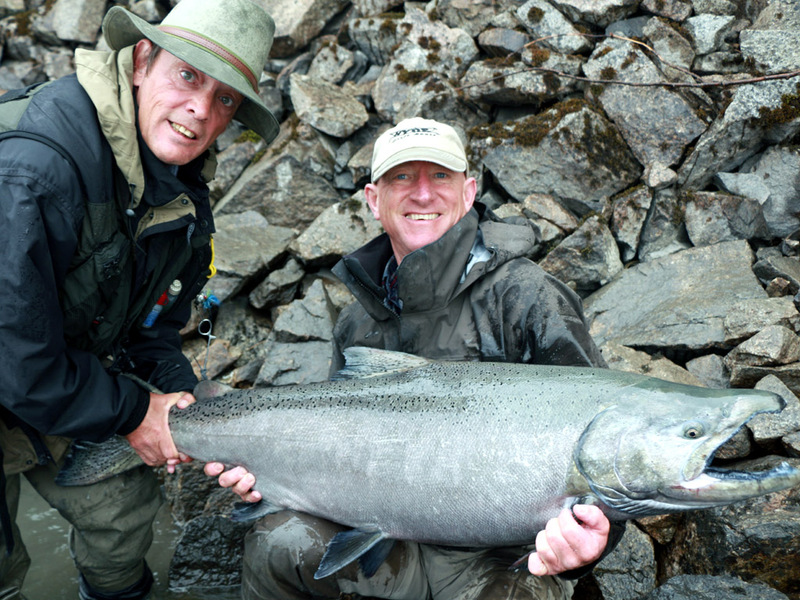 We look forward to their return next year for more super fishing and great company. 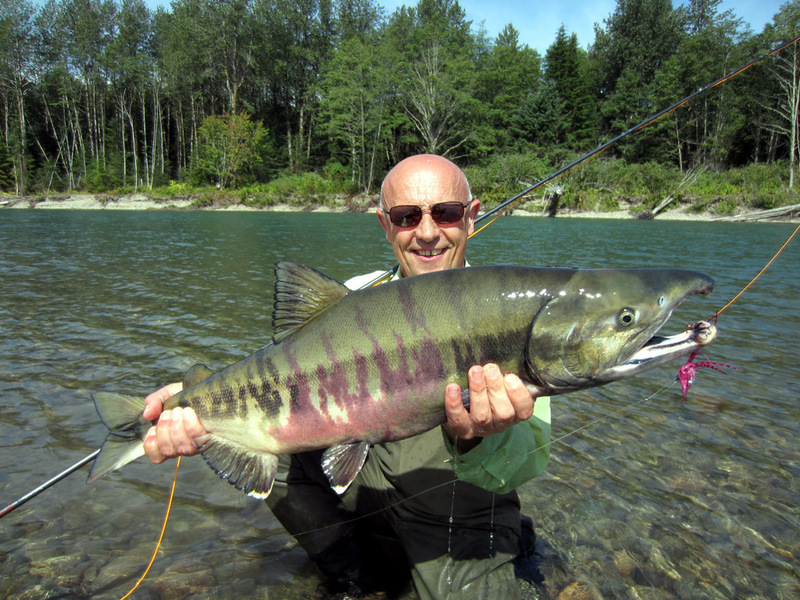 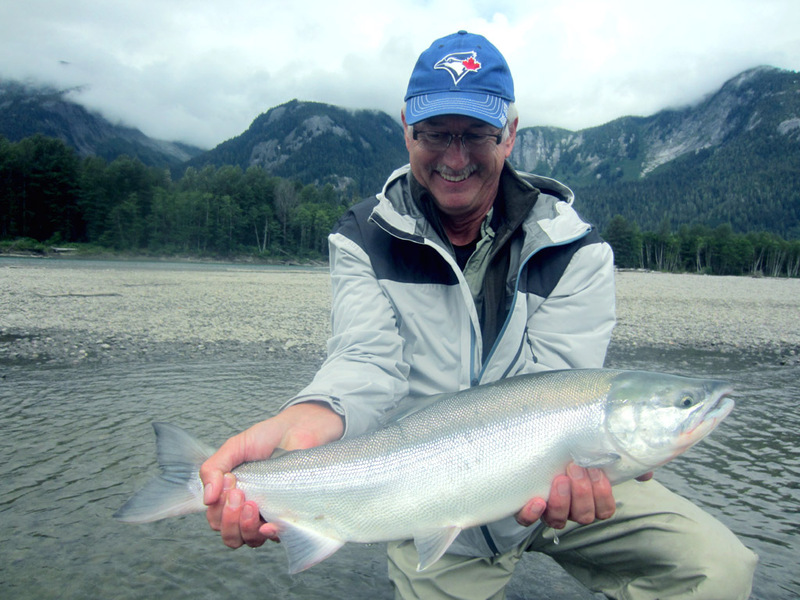 It has been another fantastic week fishing in the Skeena area. 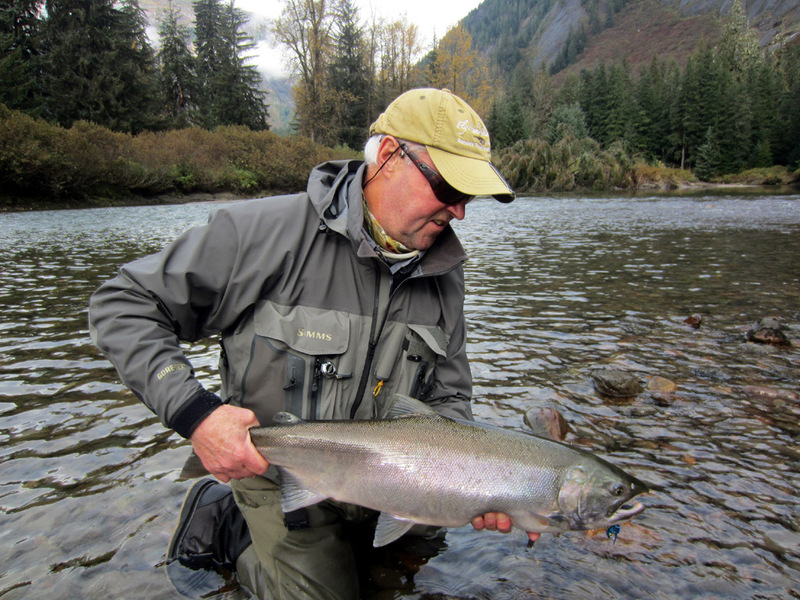 Our fly fishermen have been catching Steelhead and Coho on a variety of flies, some of which they tied especially for their trip. Each day our anglers have been landing some good sized Steelhead. 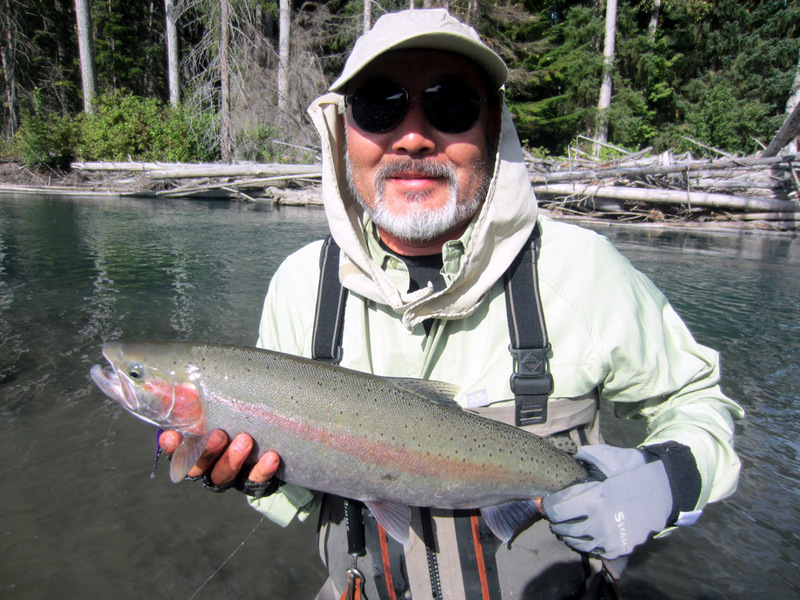 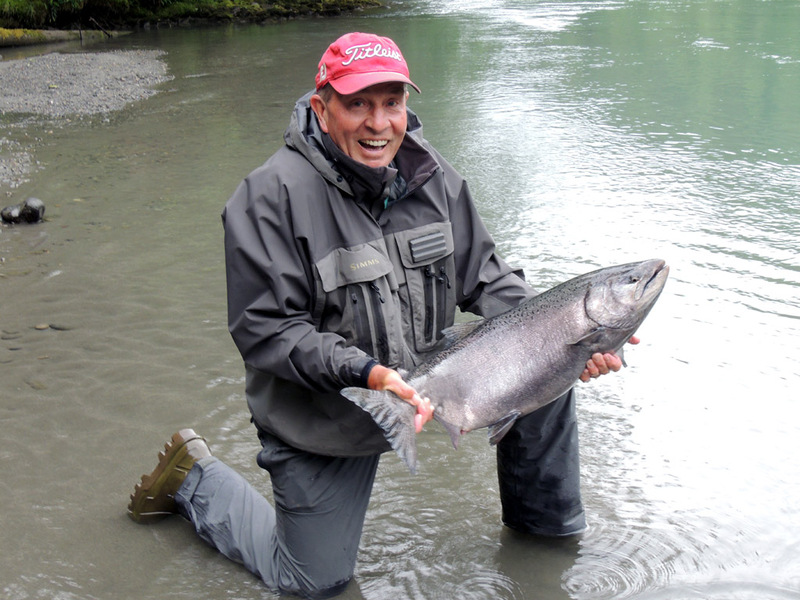 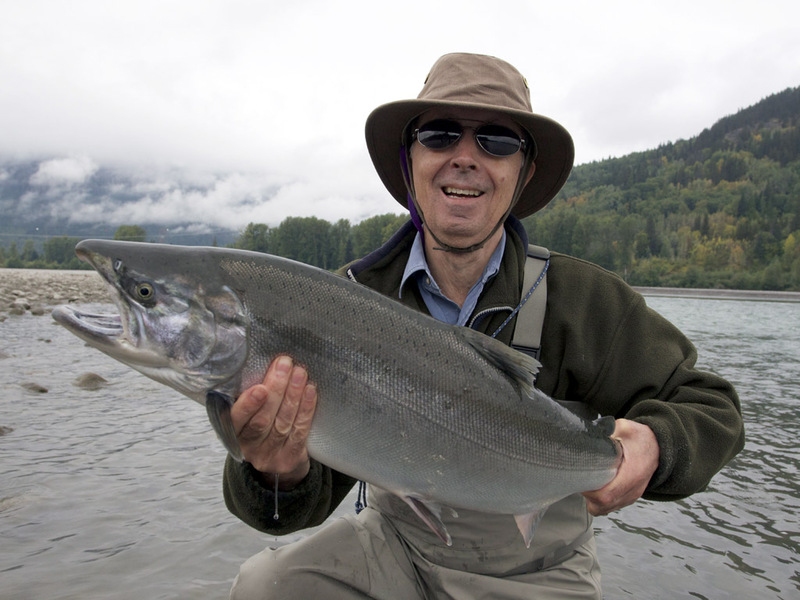 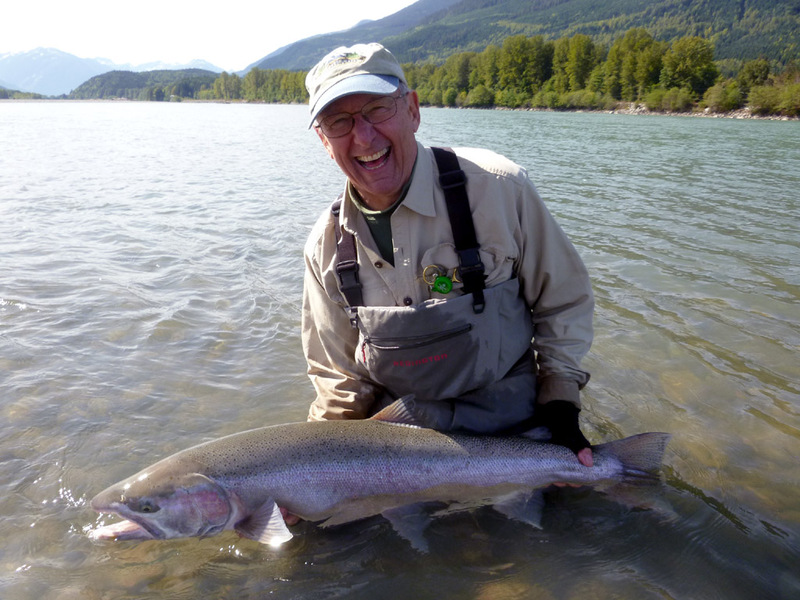 The high point of the week was Mario’s superb Steelhead measuring 41 inches – the smile says it all! 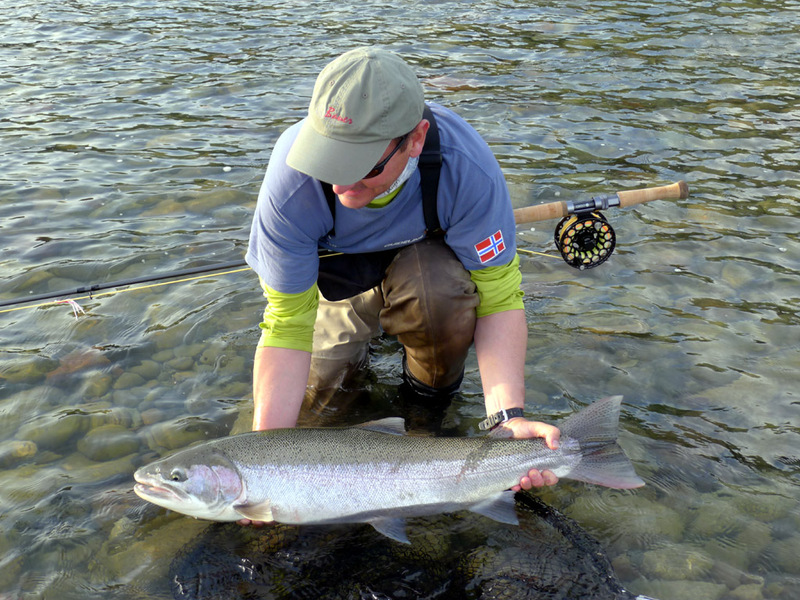 “Team Sweden” and our guests from the US, UK and France had a super week. 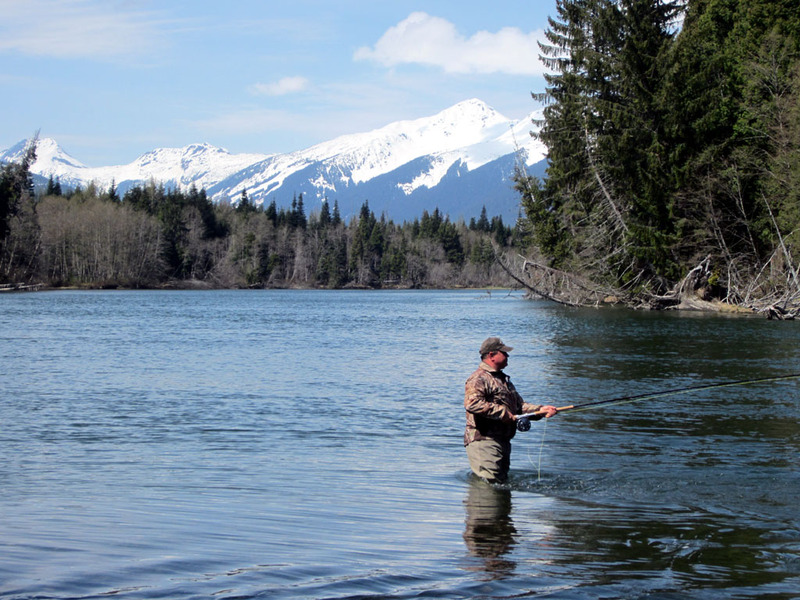 Although fishing is always the primary objective, the scenery and wildlife can certainly add to your experience. 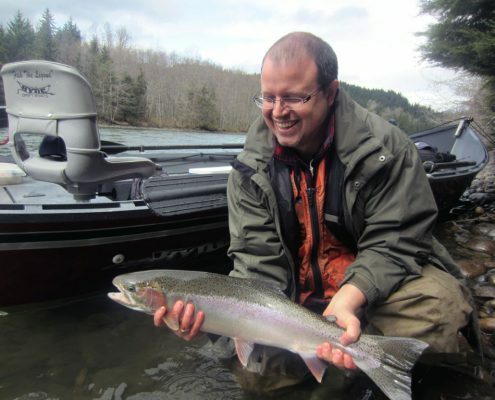 The guys caught some super Coho, Trout and Steelhead. 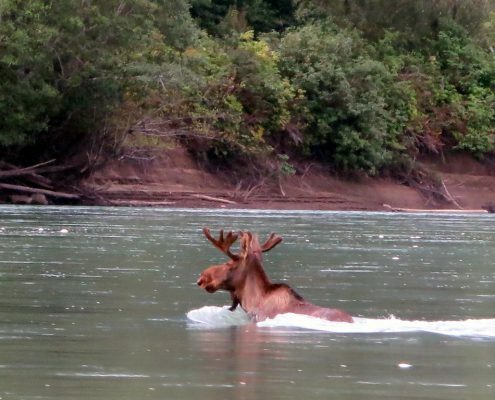 We also had the pleasure of seeing a massive bull moose, wolves, black and grizzly bears and an assortment of birds including eagles, ospreys and kingfishers. 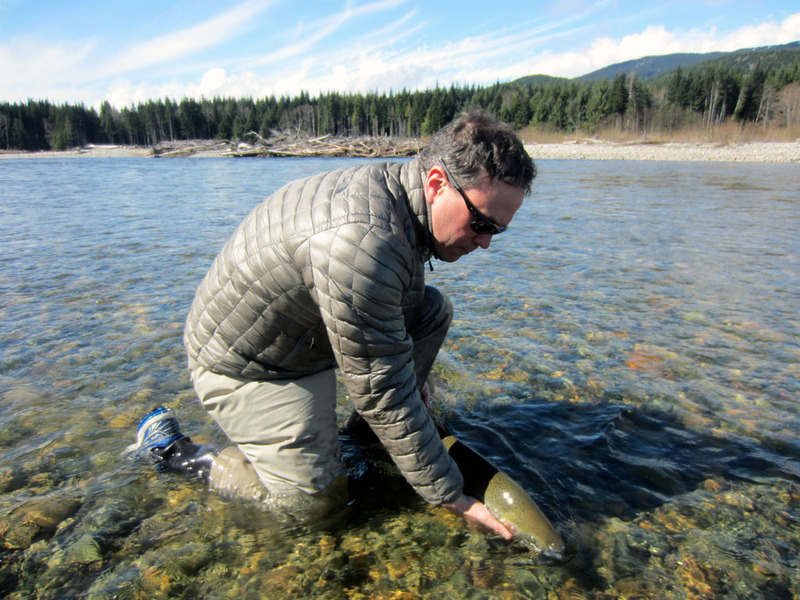 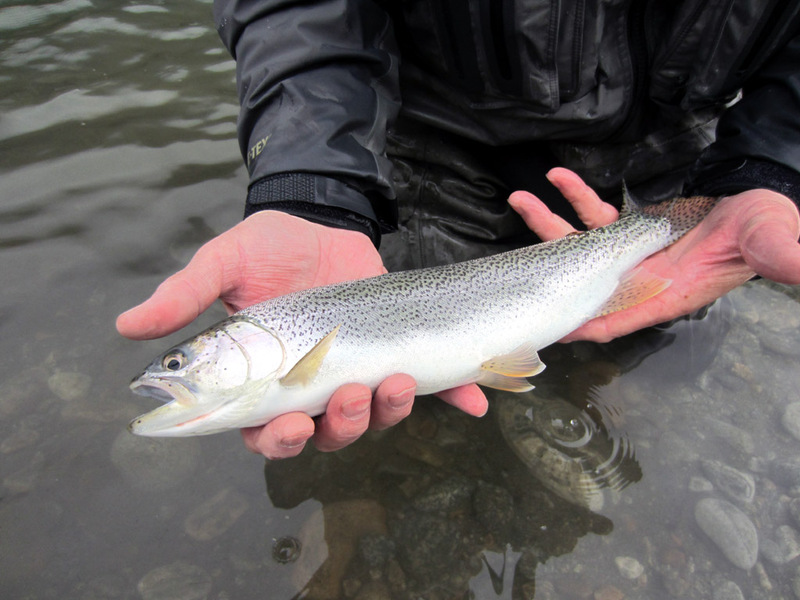 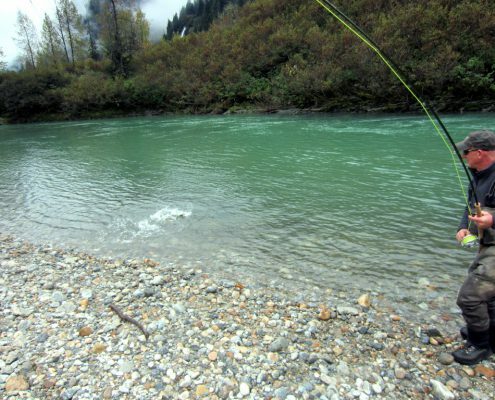 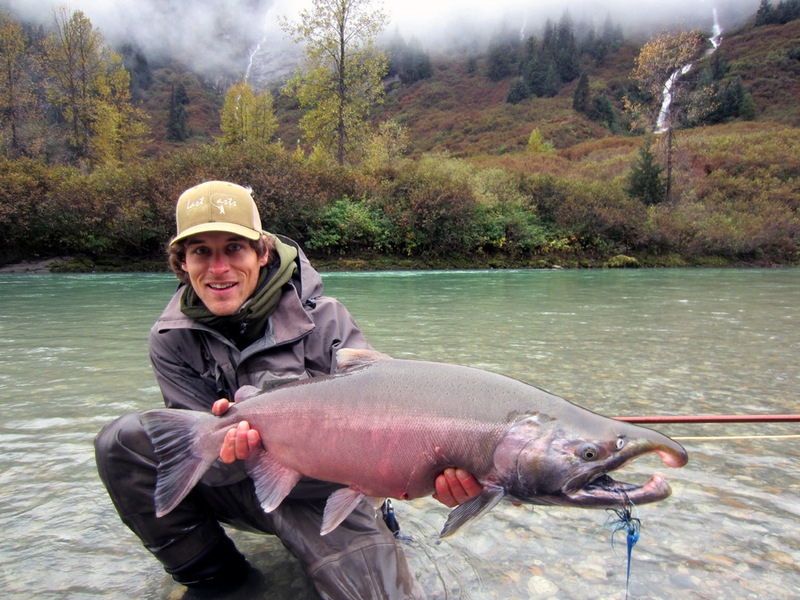 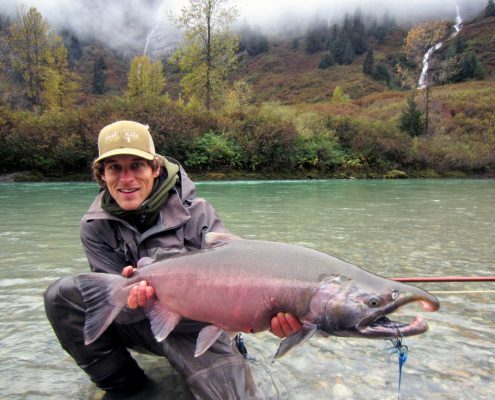 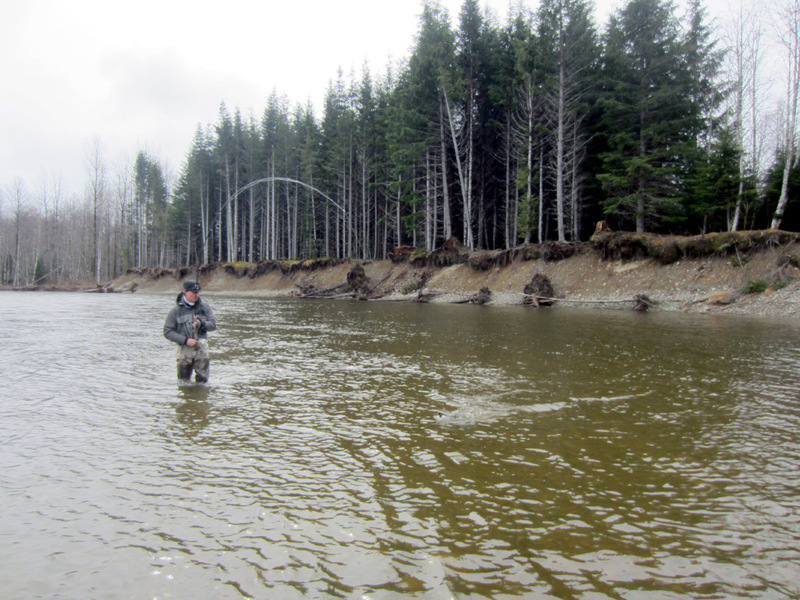 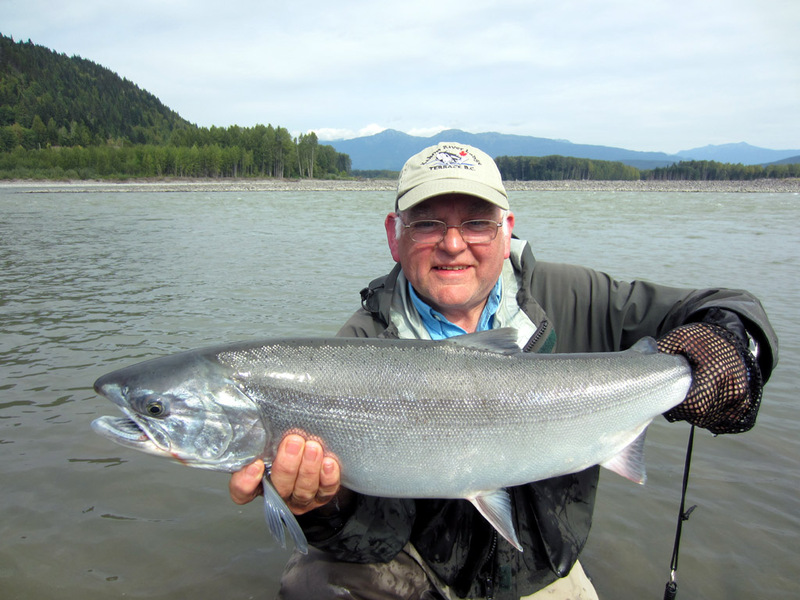 Conditions on the Skeena have been good and a lot of fish have been going through. 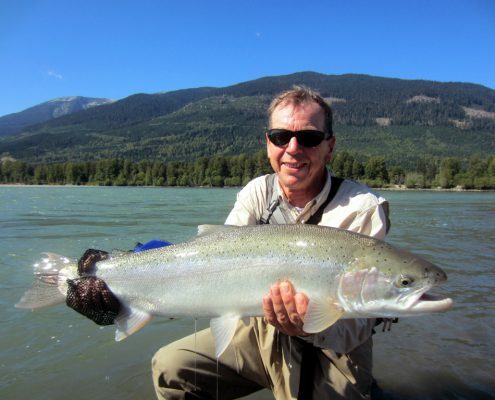 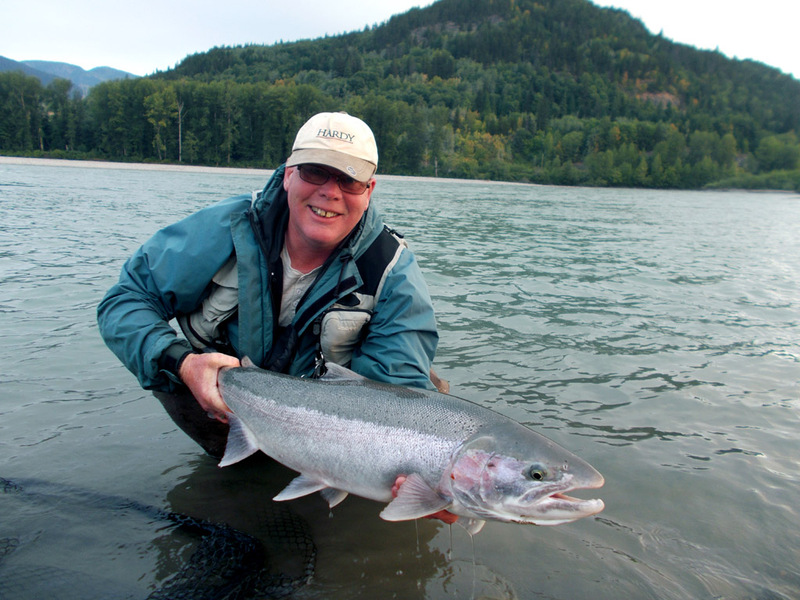 It’s the time of the season when our regular guests return to fish the mighty Skeena for Steelhead. 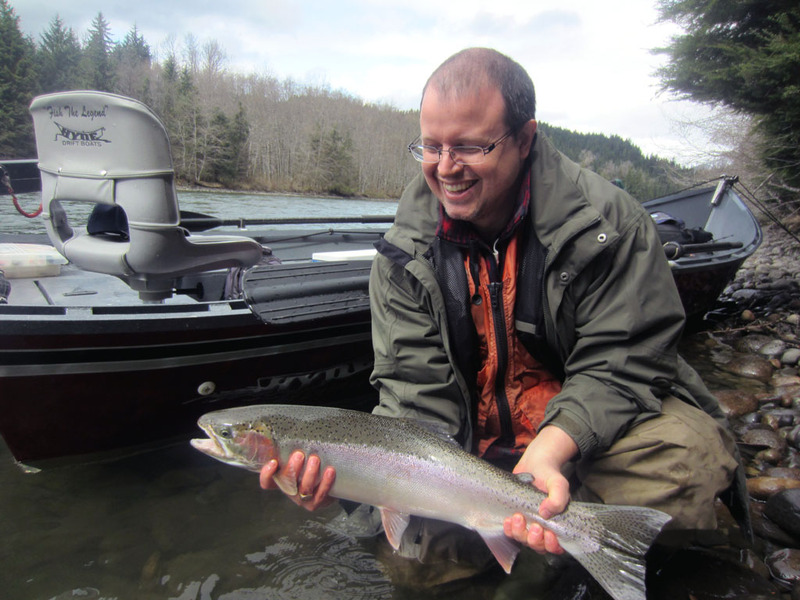 And they weren’t disappointed, catching several Steelhead each day and some large Coho. 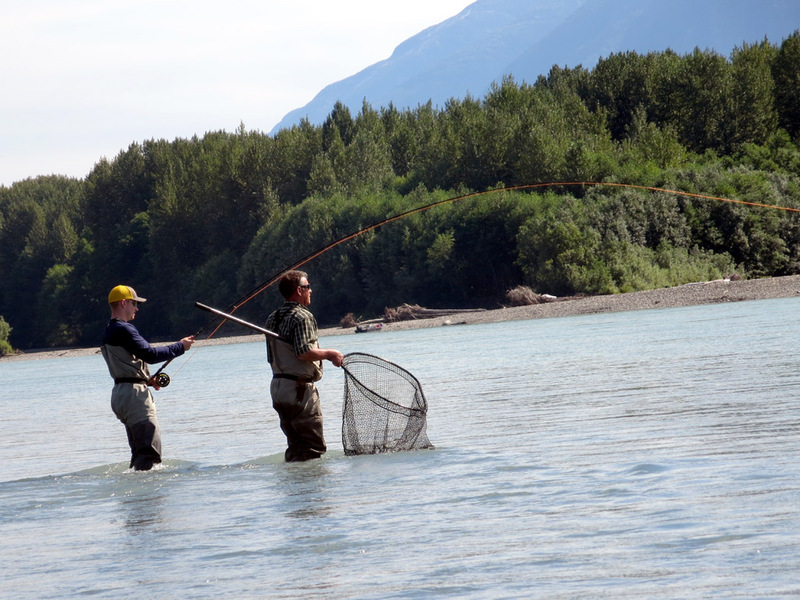 Sadly the two weeks with everyone went by too fast………….but they will be back next year to do it all again! Avid fly anglers François and Camille had some great days out on the Skeena. 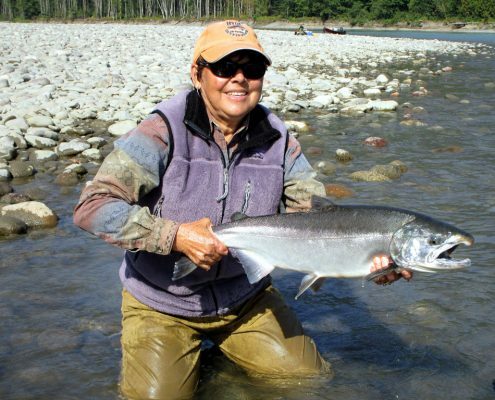 It is often said that its the lady anglers who catch the biggest fish and Camille showed that this is the case as she out fished the guys most days. Pierrot Bernier (Assistant Guide) was there to help Camille hang on to her lively fish for the photos. 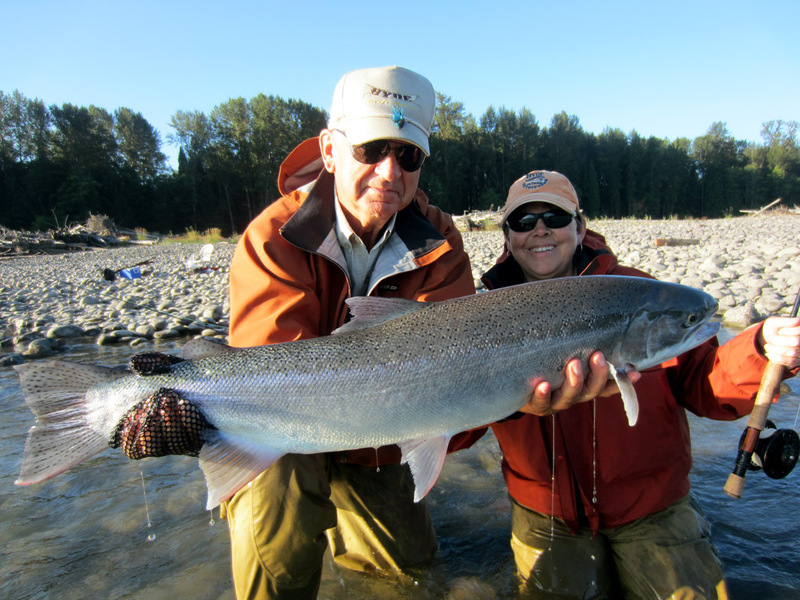 François and Camille fished for the week with returning guest Andrew W. Last year Andrew landed a Steelhead of over 25lb (see fishing report August 31st 2013) and this year he was back on form landing some large Steelhead and Coho (top photos). 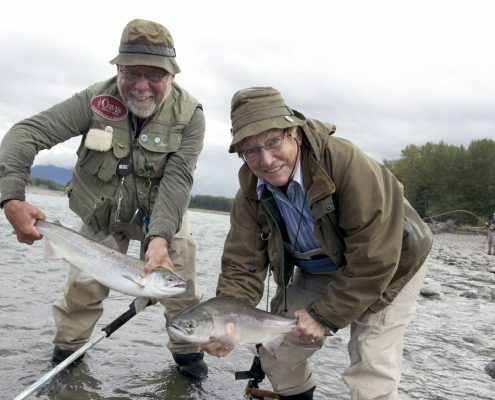 First time guests Syd, Jim and David were out on the river too. 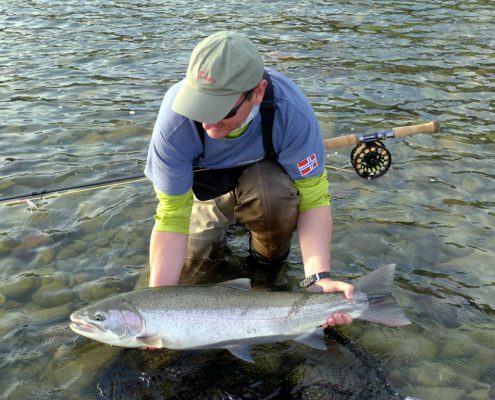 During their week they landed some fantastic fish and are joining us again next year. All the Kalum River Team really enjoyed the groups’ company and we have made some new friends. 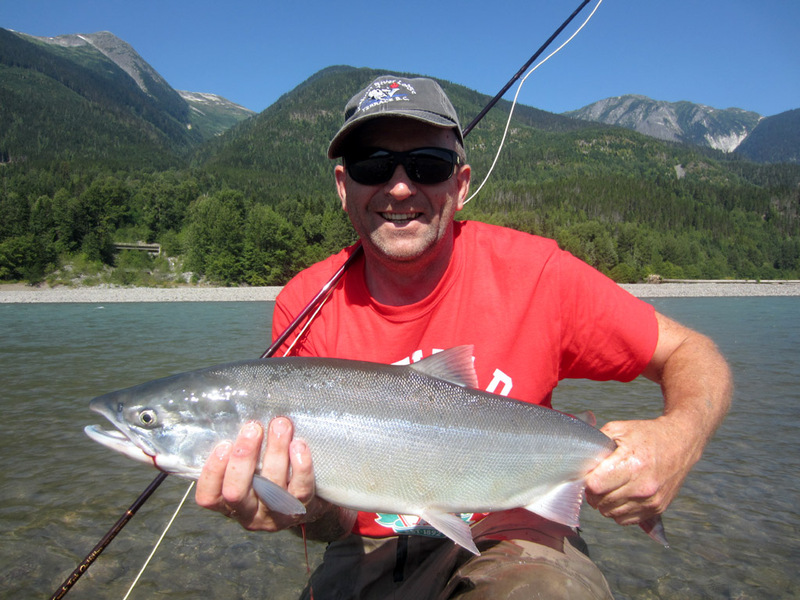 Catching Sockeye on a fly rod is always great fun and pound for pound Sockeye are hard fighting acrobatic fish. 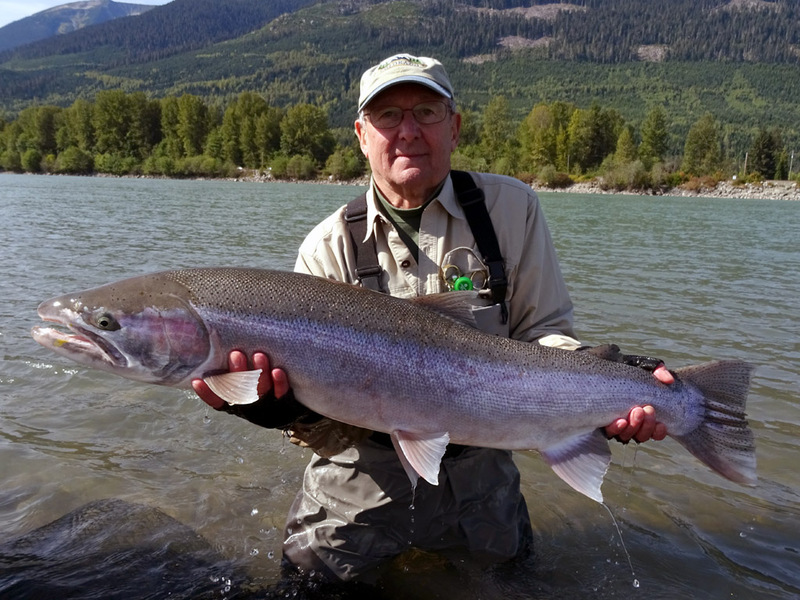 With a bumper run of Sockeye this year our anglers have been busy hooking these fresh silver salmon. 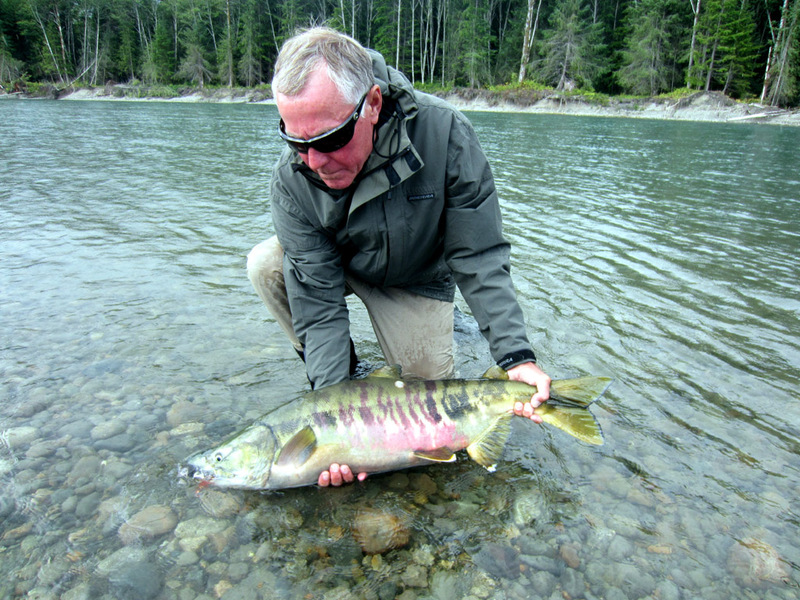 Its an action packed time to be here with all five species of salmon and Steelhead in the rivers. 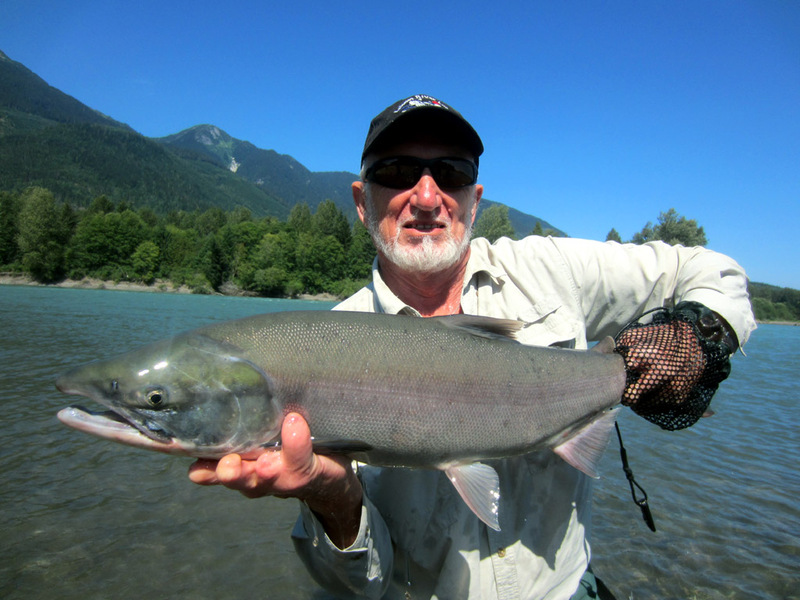 Returning guest Rab had a great week fly fishing on the Skeena and landed some large Coho and Steelhead, along with many Sockeye and Pink salmon. 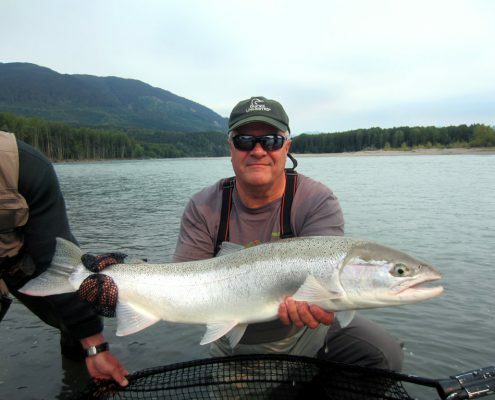 First time guests Rick, Brian, Keith and Jim all enjoyed catching some great fish too. 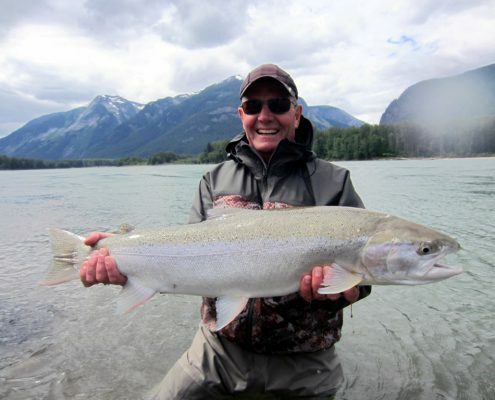 The Hydes hit the Skeena! 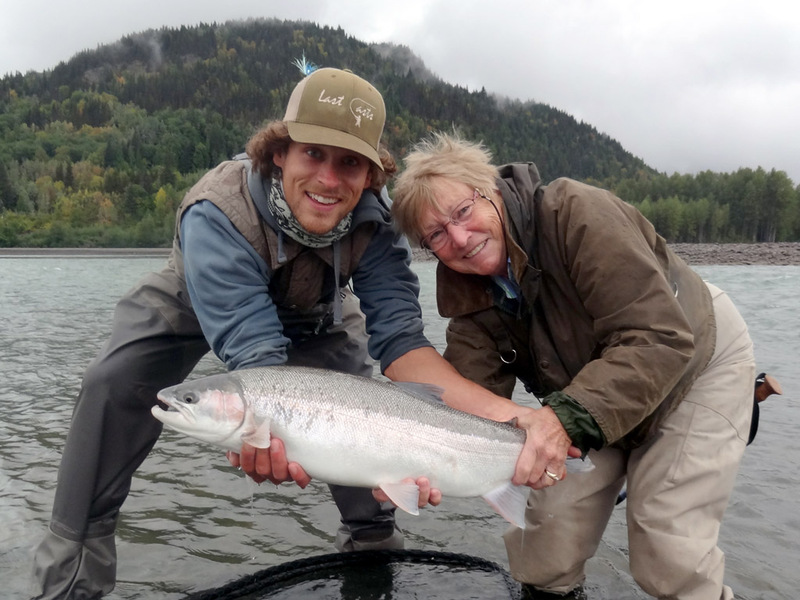 LaMoyne and J.Ann Hyde traveled from Idaho Falls to fish with us. 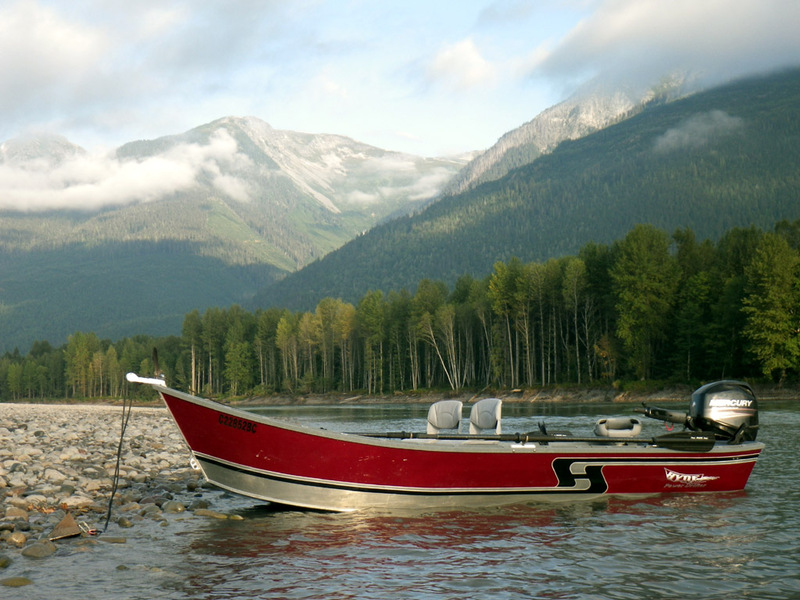 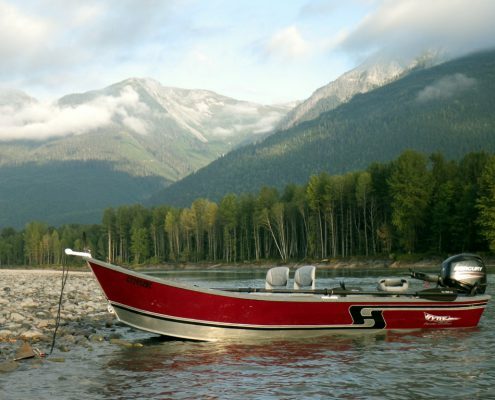 As the owners of Hyde Drift Boats they had the chance to see how our Hyde Powerdrifter performed out on the Skeena River. 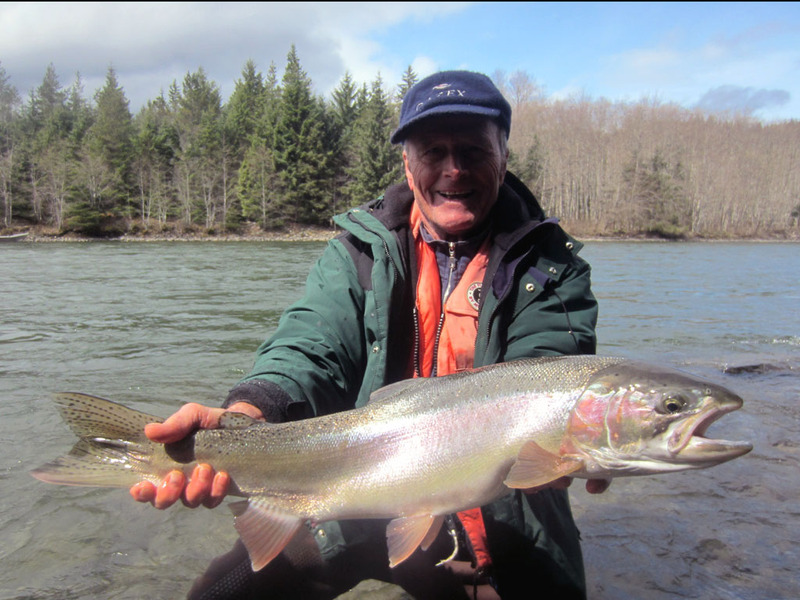 Along with their fishing friends, they landed Steelhead every day and caught a lot of Sockeye and Coho. 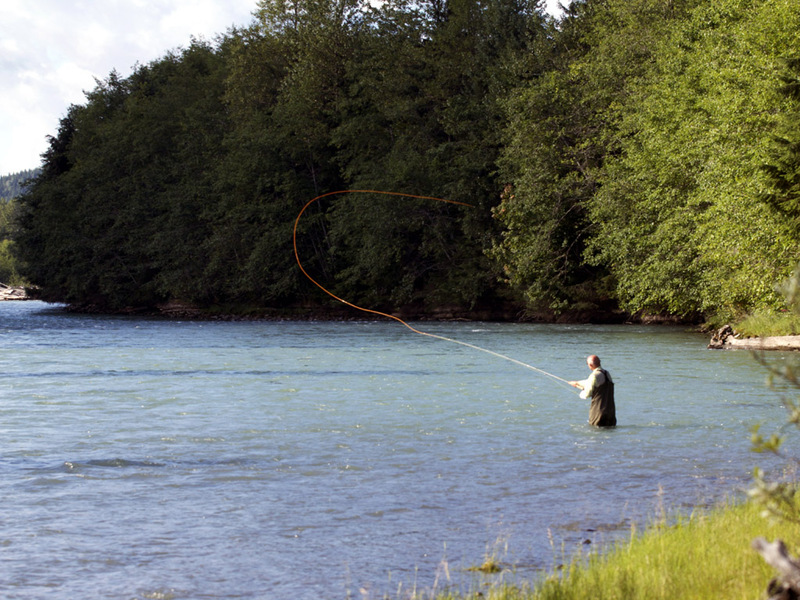 Here are just a few of the many fish landed (and a shot of our Powerdrifter!). 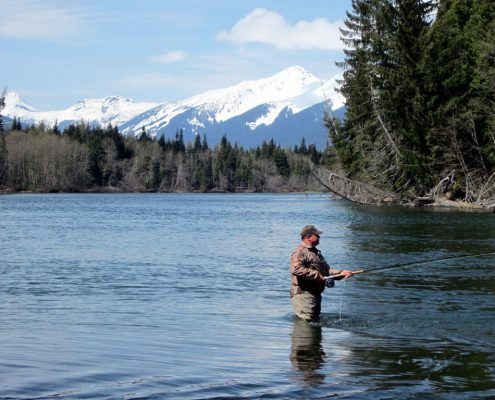 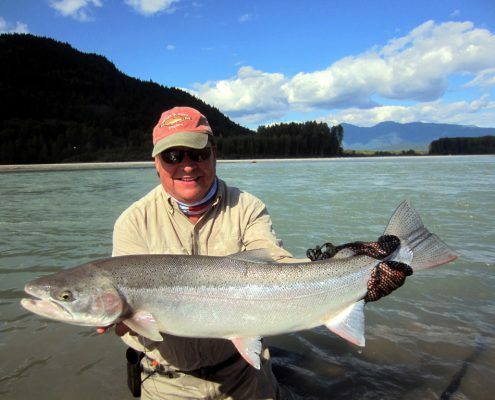 The Skeena River has been fishing well. 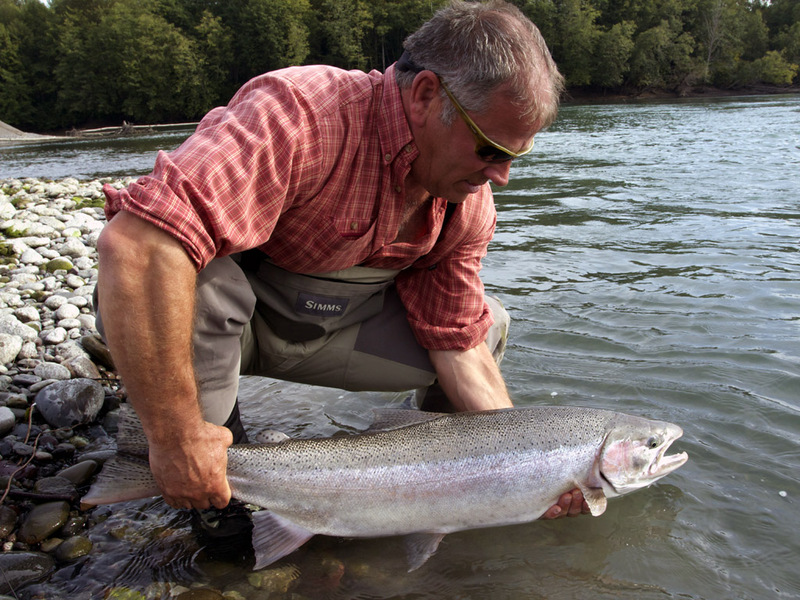 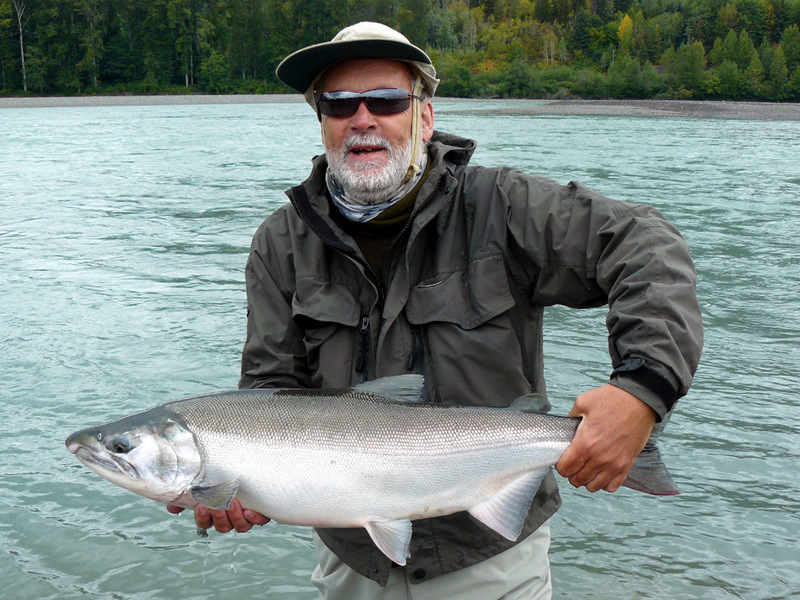 Our guests have landed many Sockeye, Coho and Pink salmon, as well as Steelhead. 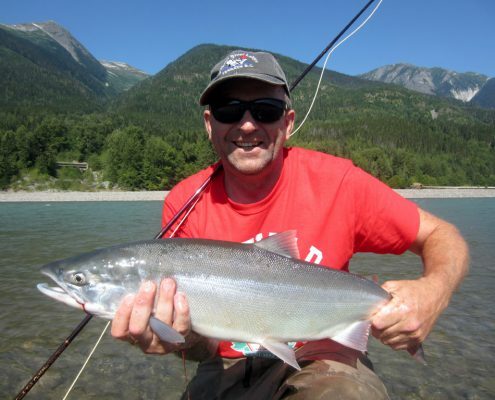 Sun and blue skies, great fishing, stunning scenery and an abundance of wild life makes a trip here hard to beat. “The boys are back” again! 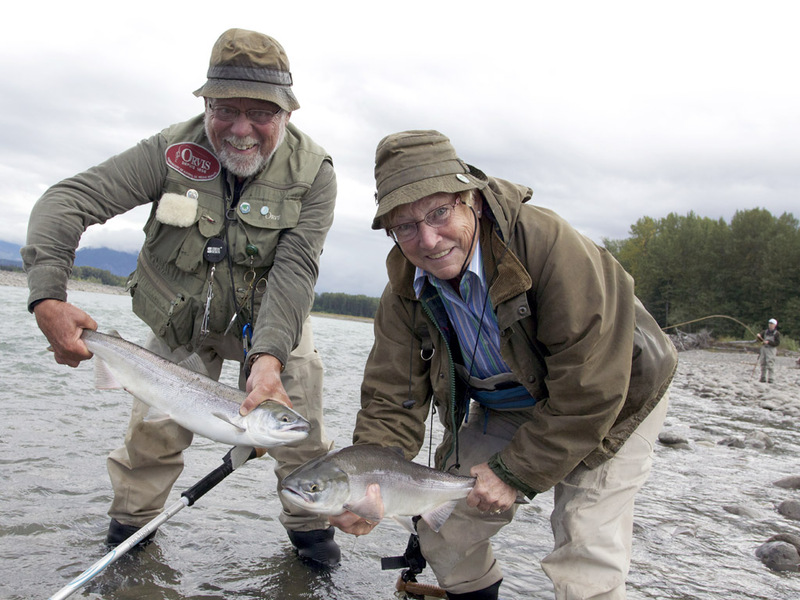 Its season three with us for Alan and Bruce. Once again they were back out on the Skeena with their spey rods. They were joined by Dave who fished with us three years ago. 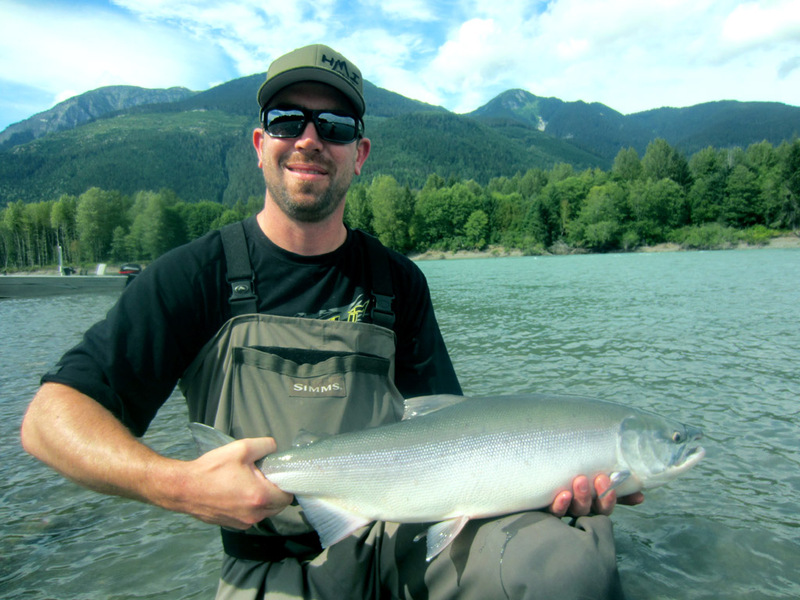 The guys had a great week catching Sockeye, Chum, Coho and Pink salmon, along with some super Steelhead. 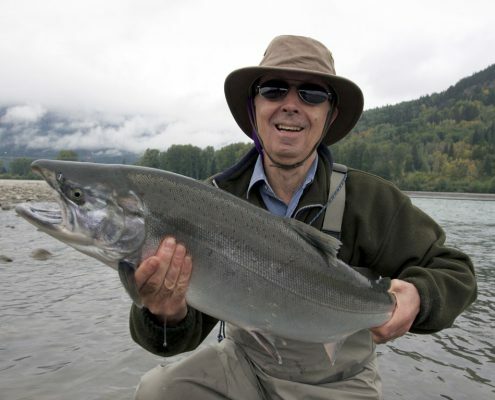 Alan did battle with a couple of large Steelhead but sadly the fish won. 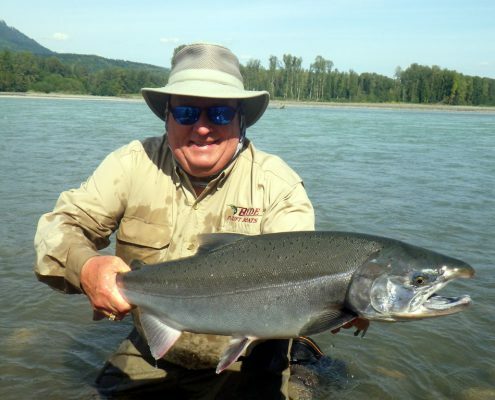 Alan said he is coming back next year as he has some unfinished business with those monster fish! 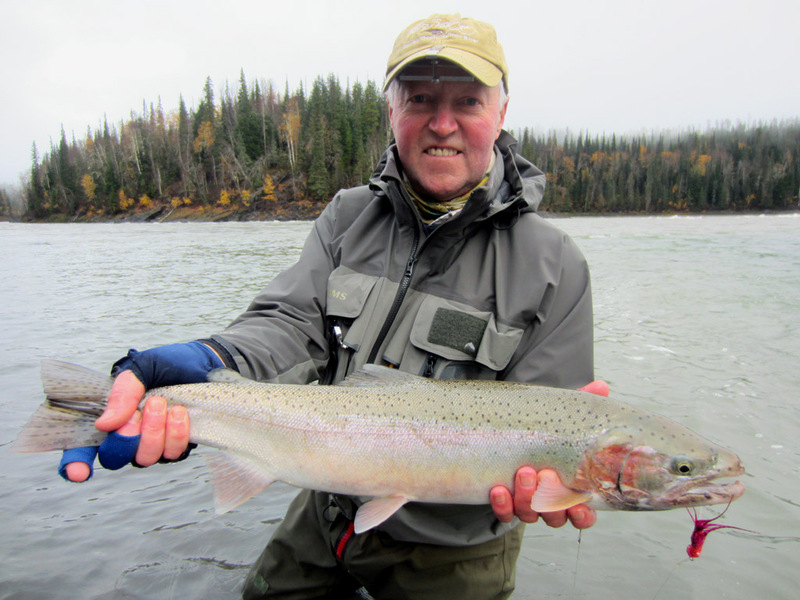 We all had a fantastic week along with the other guests at the lodge, new friendships and great fishing memories were forged. 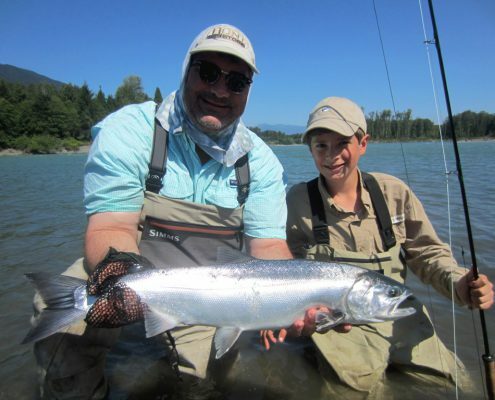 Father and son team, Chris and Henry had some great days out on the rivers. 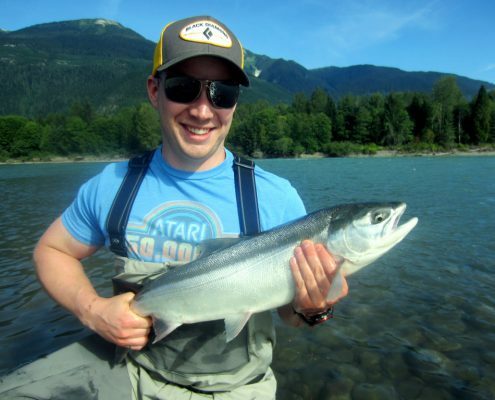 Chris joined us last year with his father and brothers. 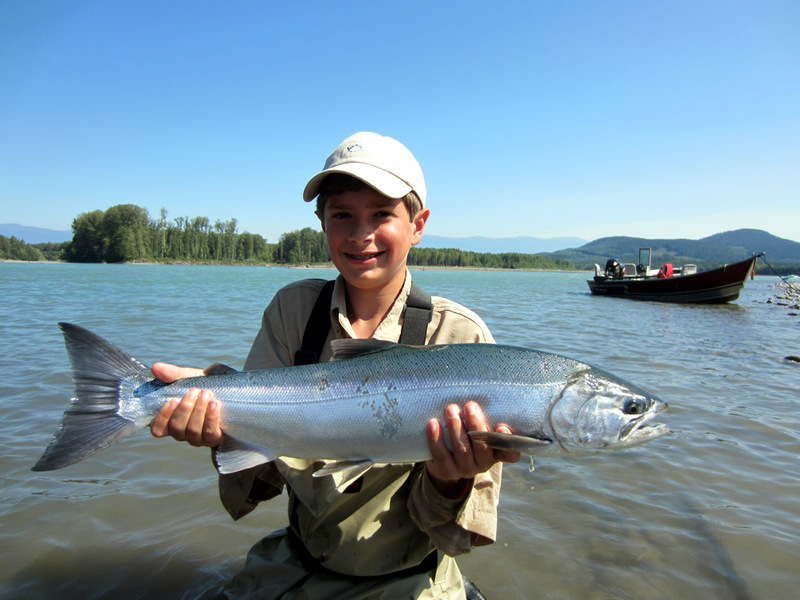 This year Chris returned with Henry, the lodge’s youngest angler at 11 years old. 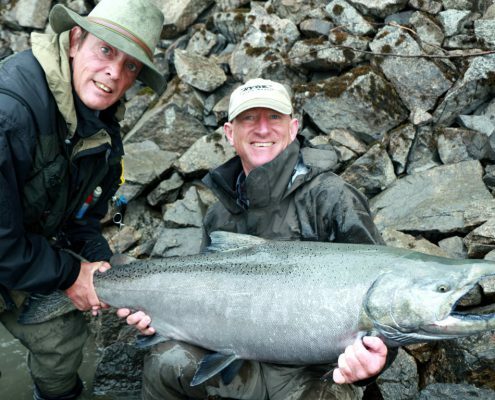 Neither had fly fished much before and our experienced guides worked with them and on the first day both anglers landed some good fish. 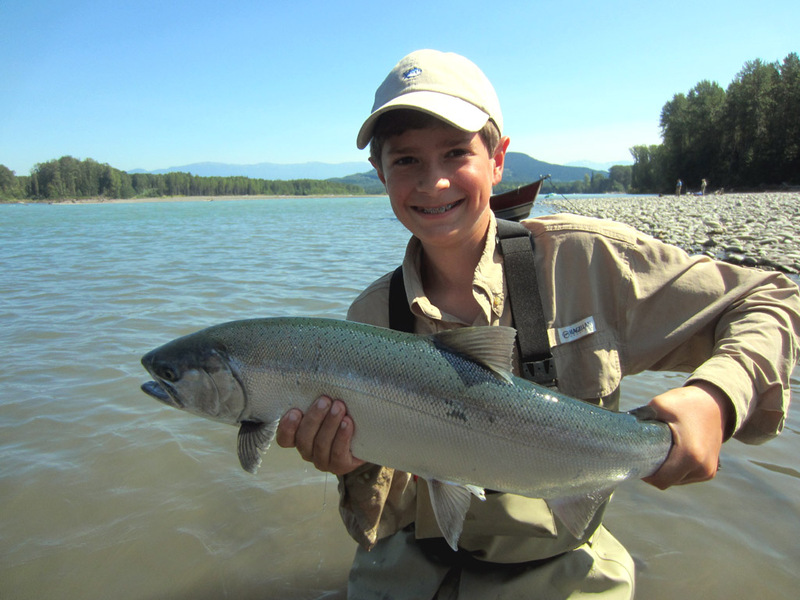 Henry has returned home to Texas hoping to persuade his mum and sister to come next year! 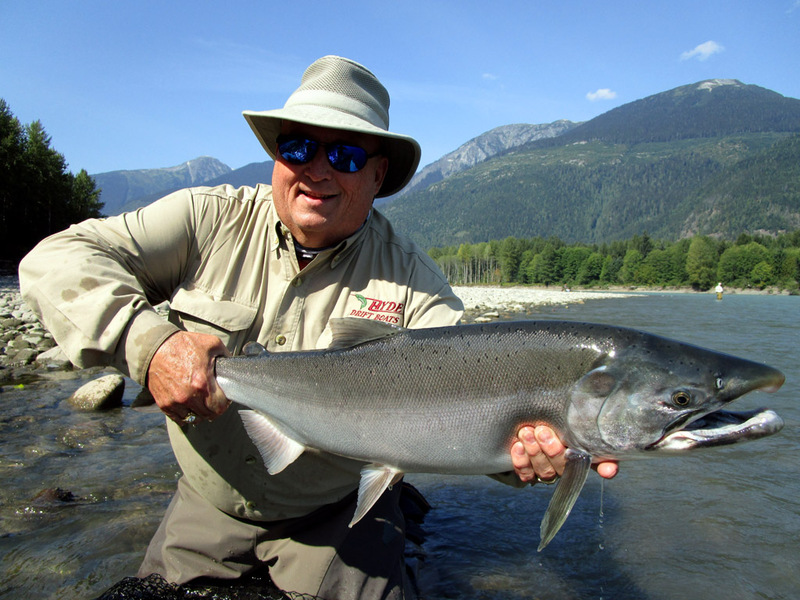 It has been an action packed week at Kalum River Lodge with a group of anglers from the UK. 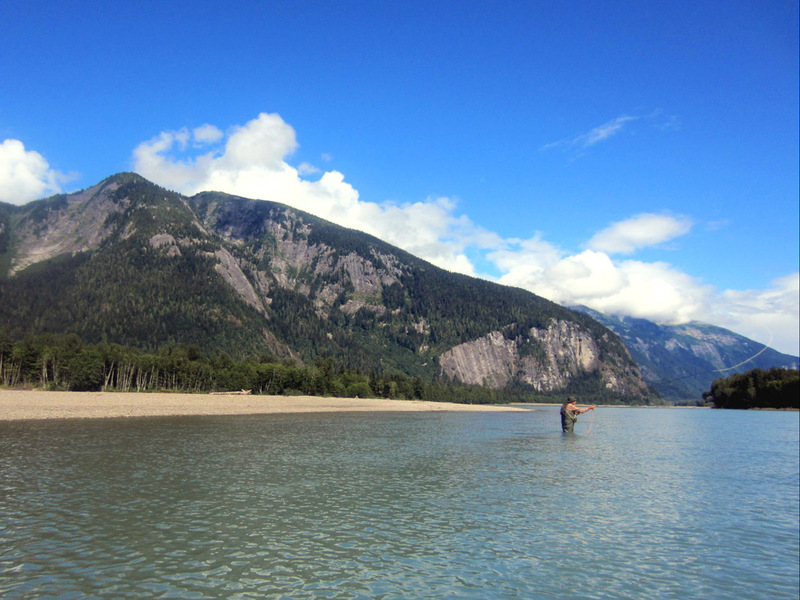 They spent the week out in the sunshine fly fishing on the Skeena and Kitimat rivers. 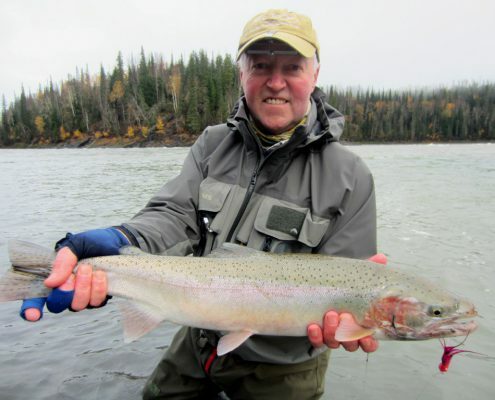 Both rivers have been fishing well and our anglers hooked into many large fish. 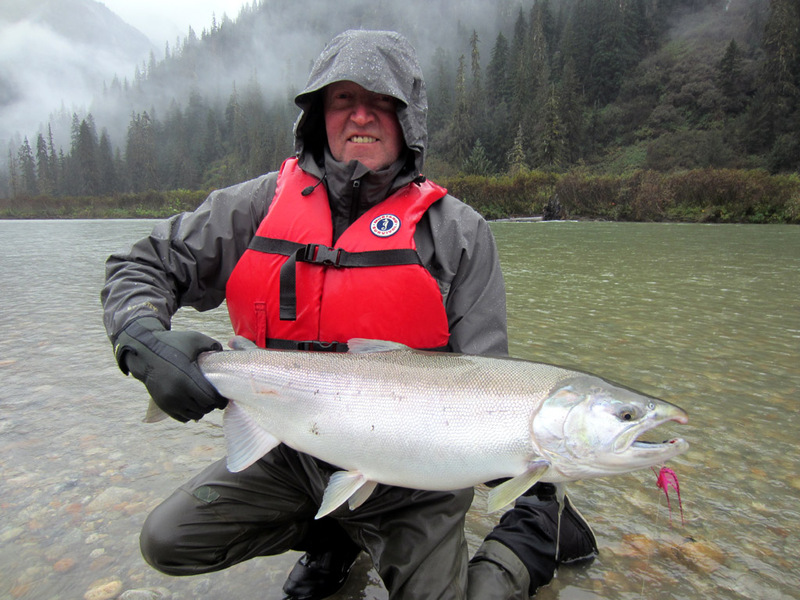 They enjoyed the challenge of fighting big aggressive Chum salmon and catching Sockeye and pink salmon too. It was good to see everyone catching some super fish and a few lucky anglers landed some nice early season Steelhead. 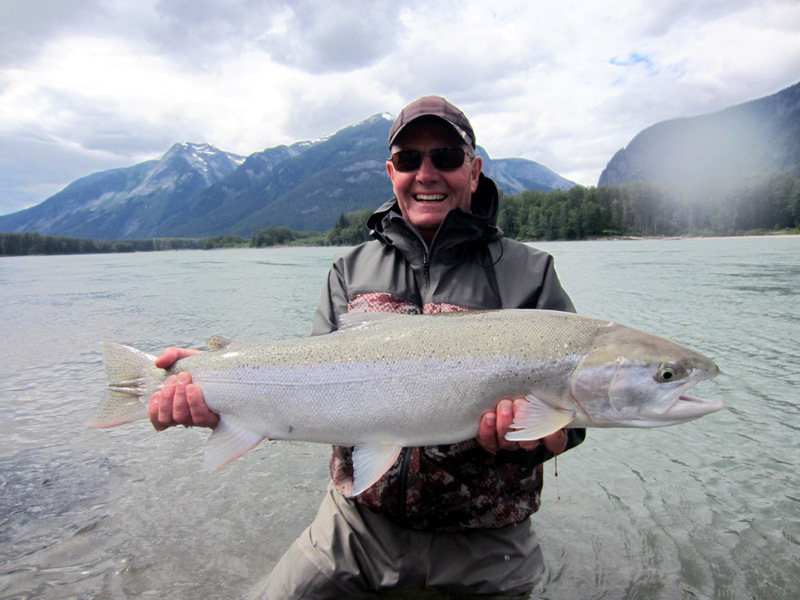 All of us at the lodge really enjoyed the week and would like to thank everyone for joining us. Several members of this years group are coming back next year for some more great fishing – we will look forward to that! 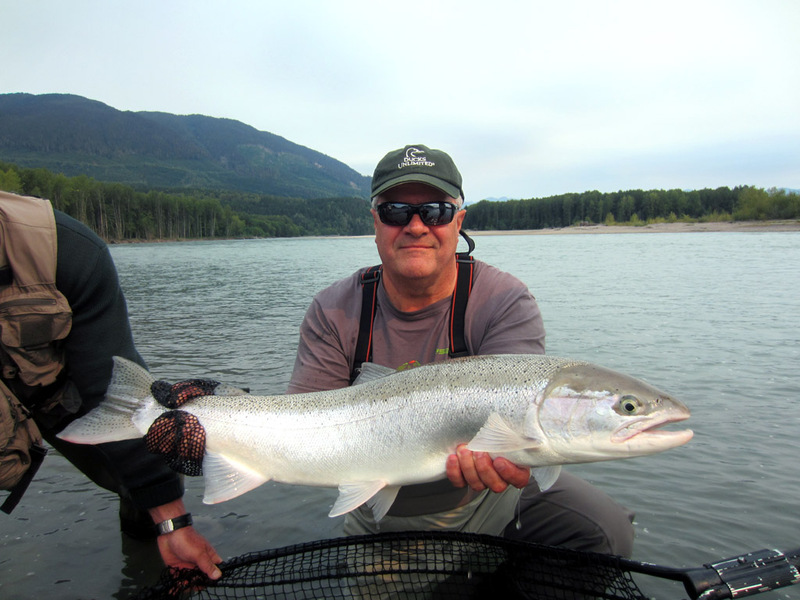 After a successful spring Steelhead trip with us this year (Fishing Report April 28th 2014), Randy joined us again for some prime Chinook fishing. In their three days Randy and Rick landed these super fish. 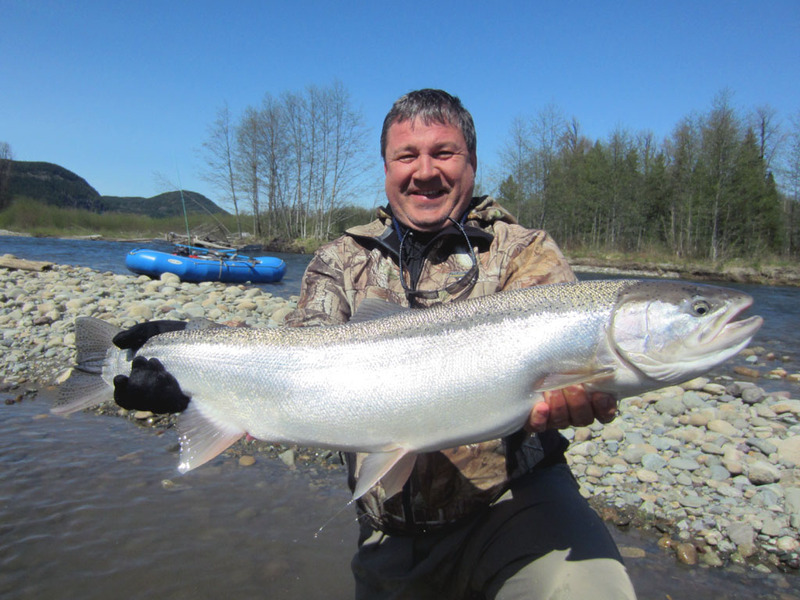 They hooked into several very large Chinook which were so powerful the guys had to jump in the boat and follow them down the river. 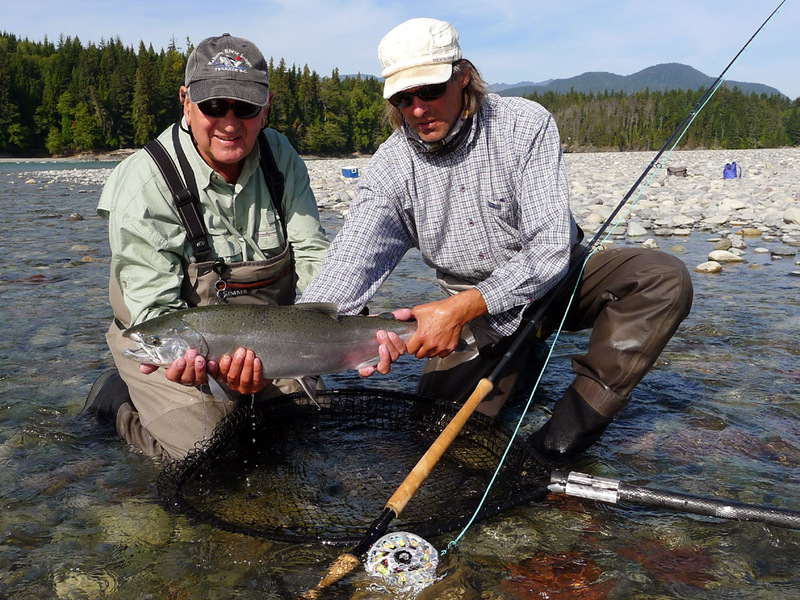 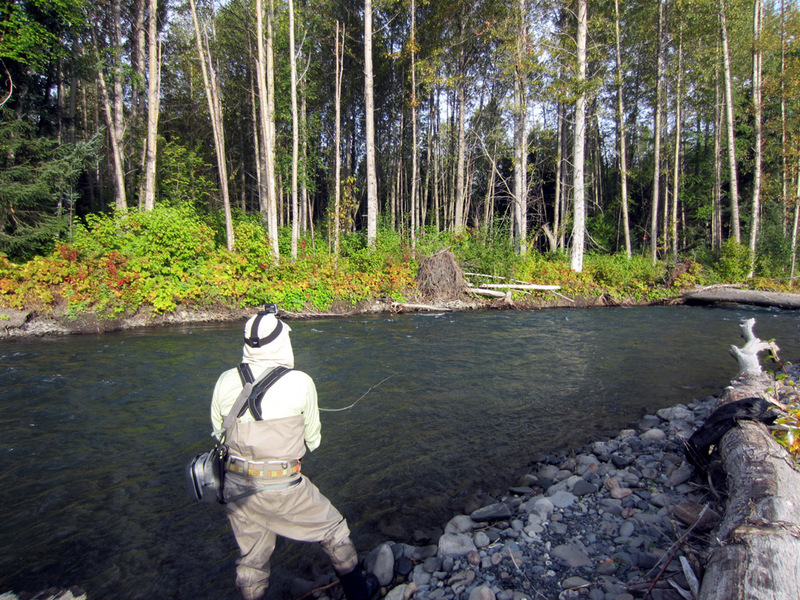 Guests Marc and Helen enjoyed the hot sunny weather whilst fly fishing on the Kitimat and Kalum Rivers. 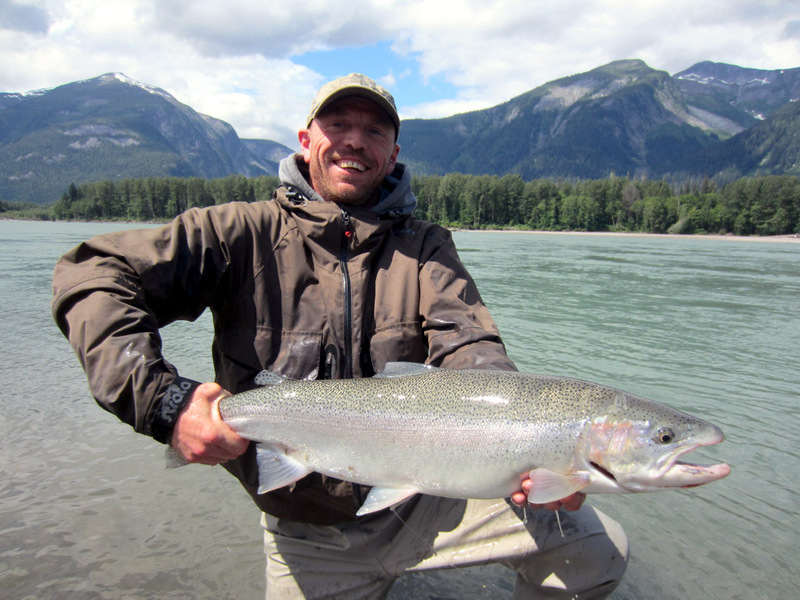 Its prime time for Chinook and both Marc and Helen hooked some large fish. 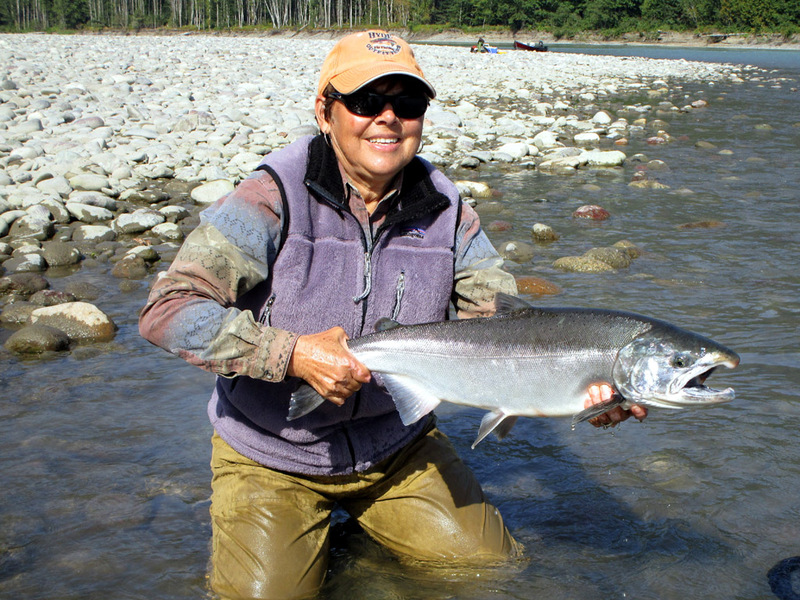 Helen fought a monster Chinook in an epic battle lasting an hour before the fish released itself without posing for a photo. 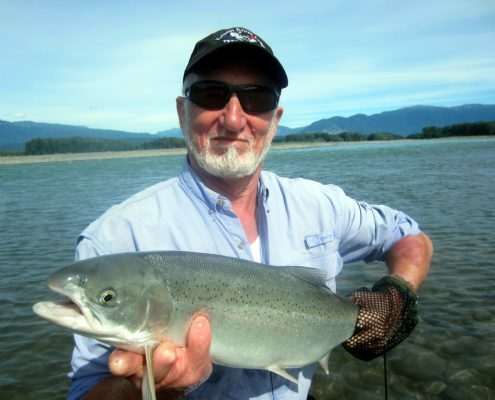 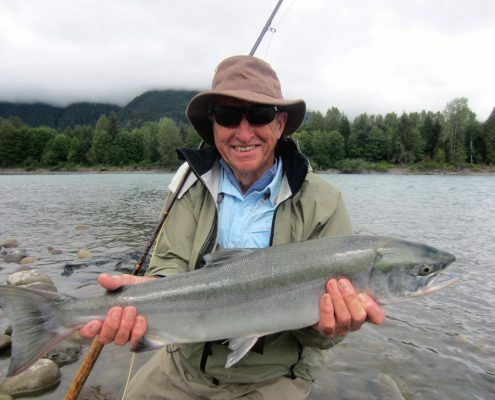 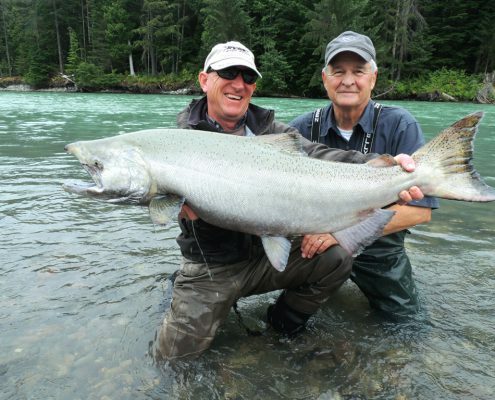 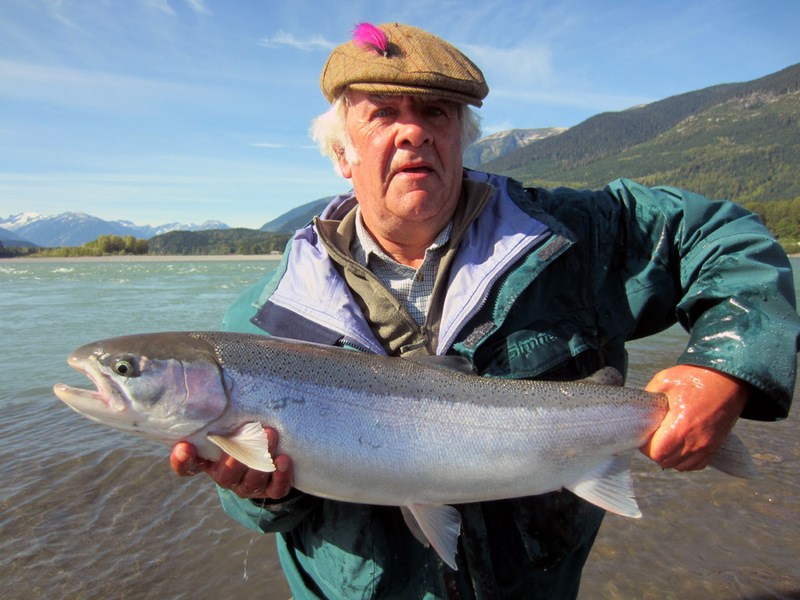 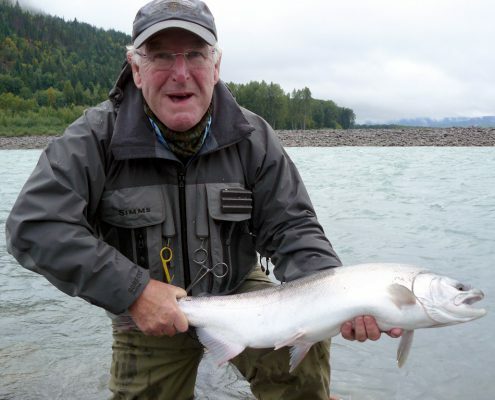 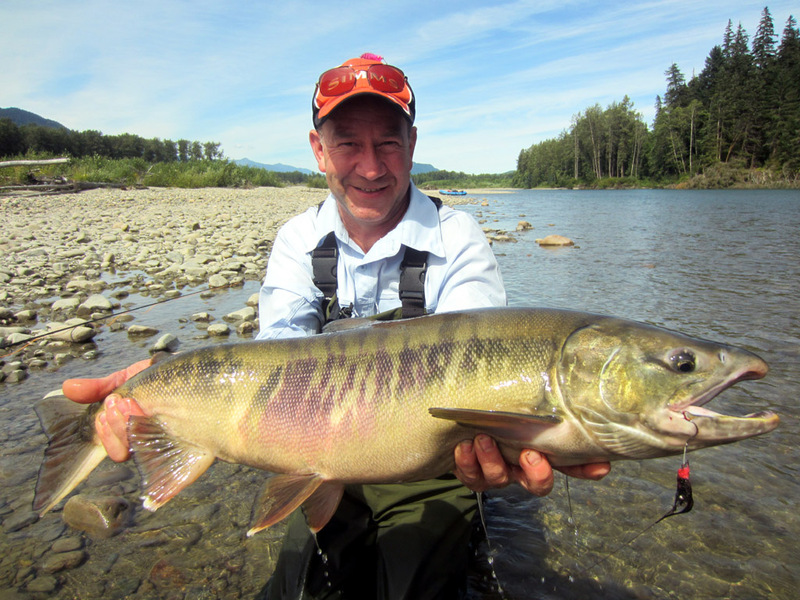 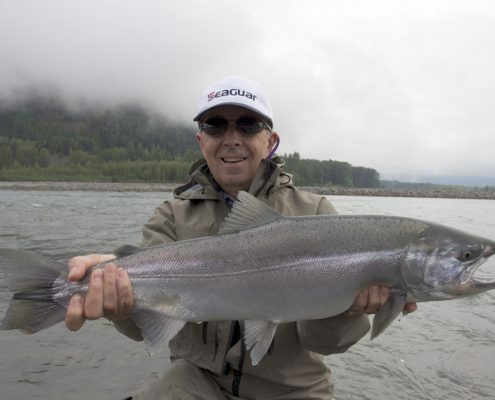 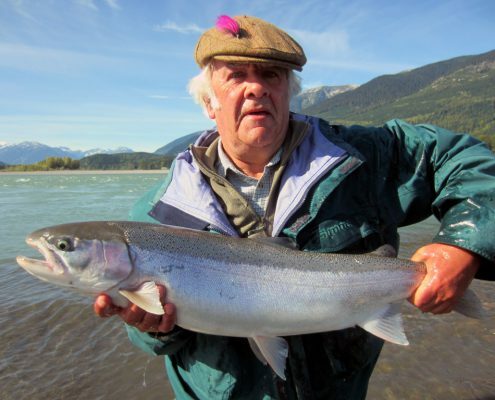 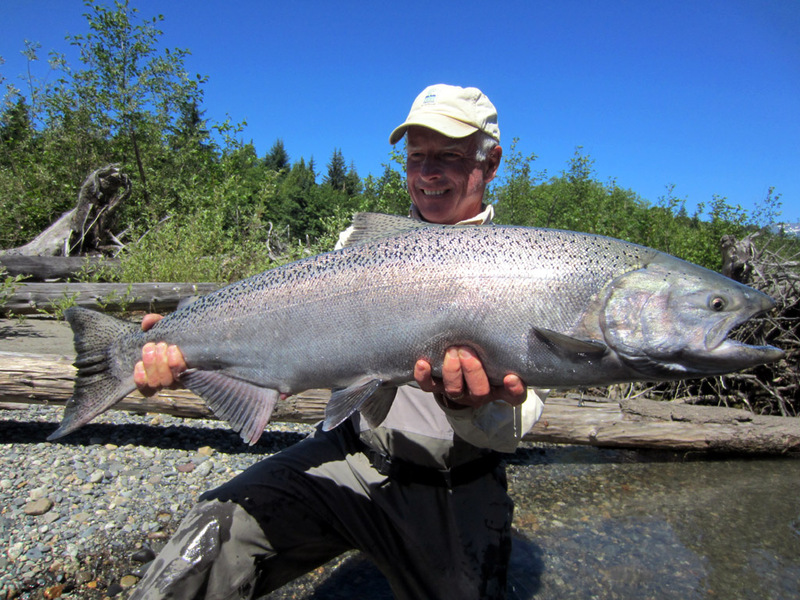 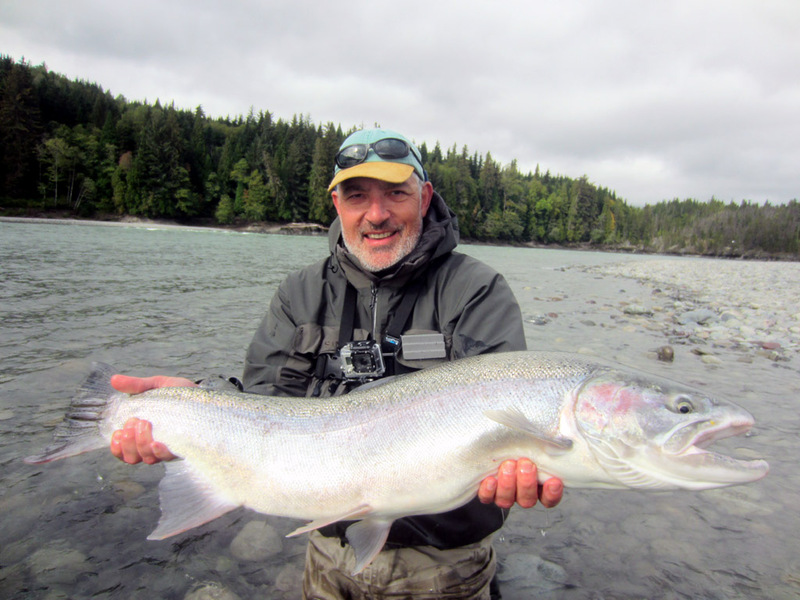 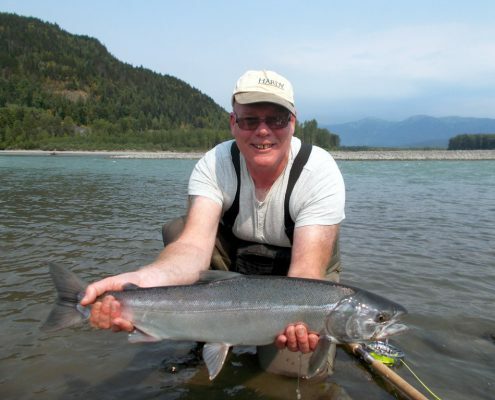 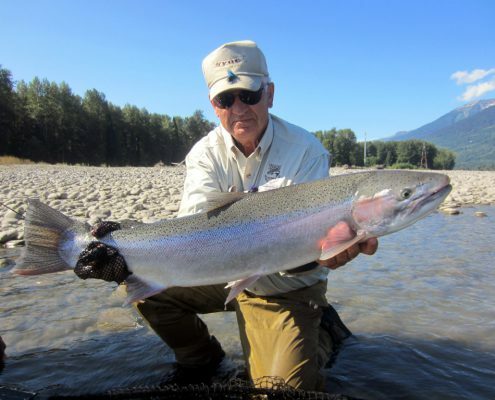 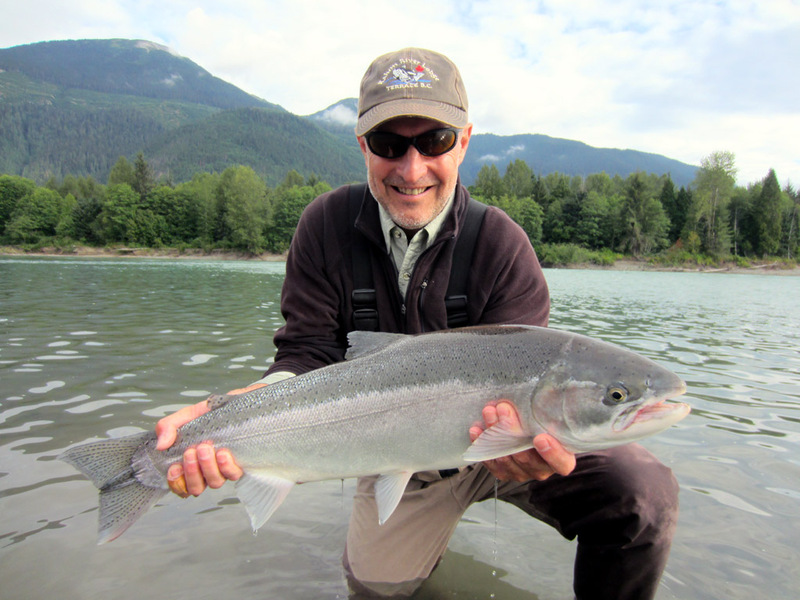 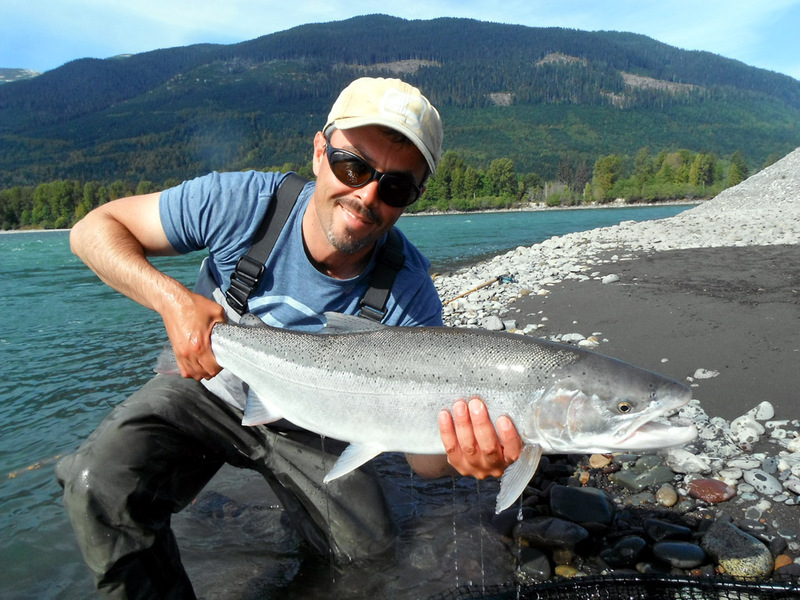 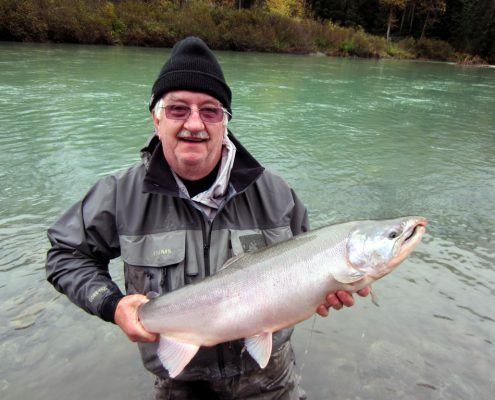 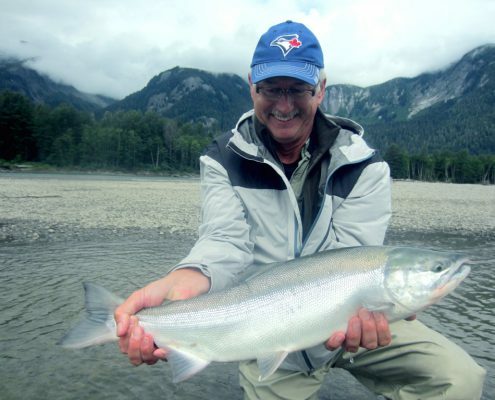 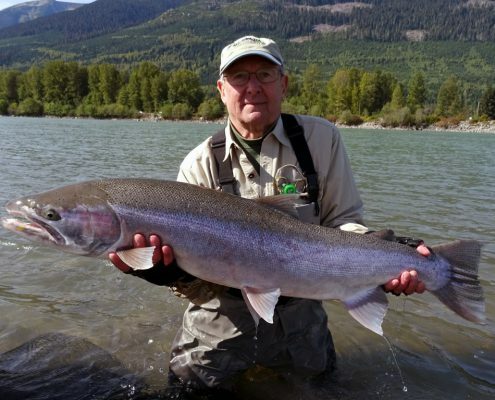 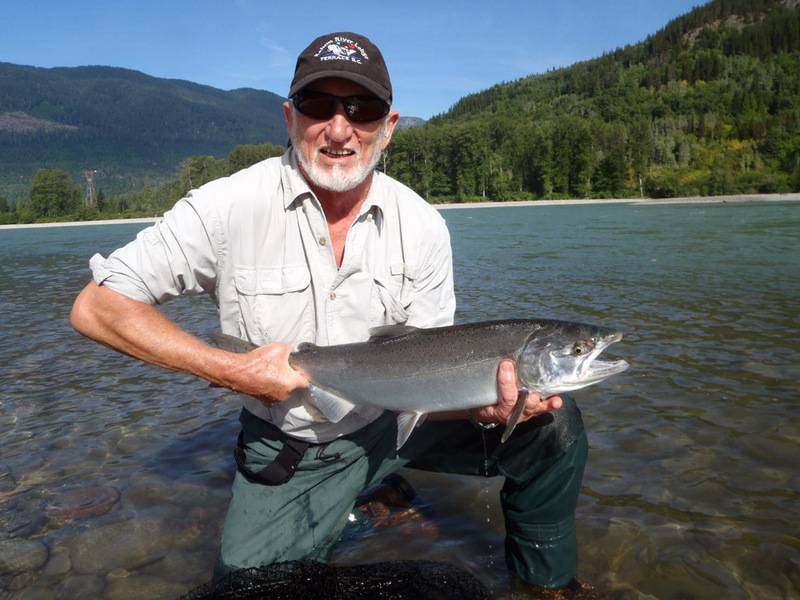 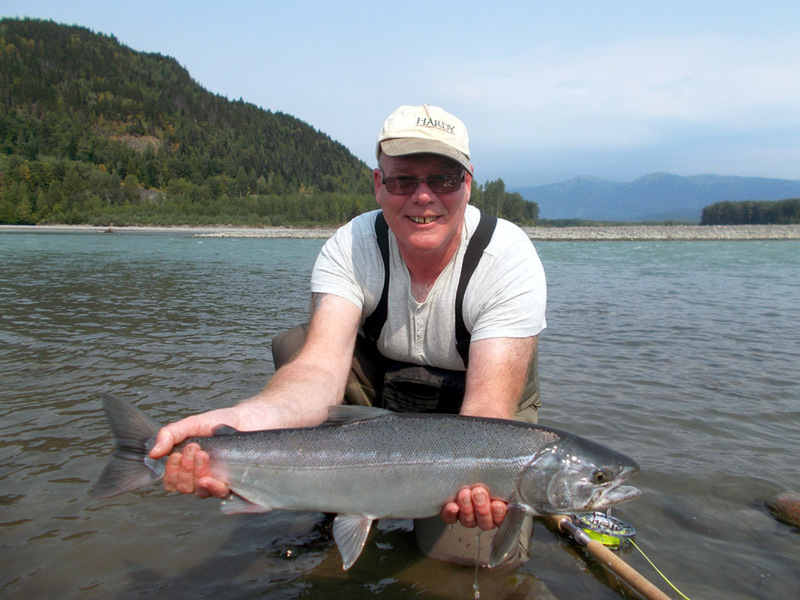 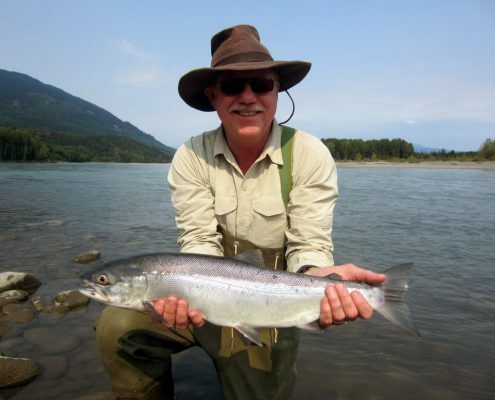 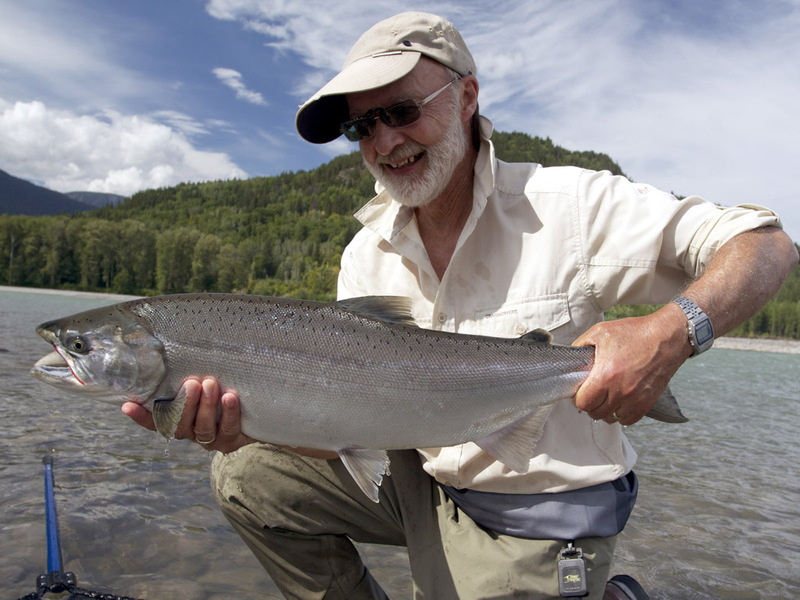 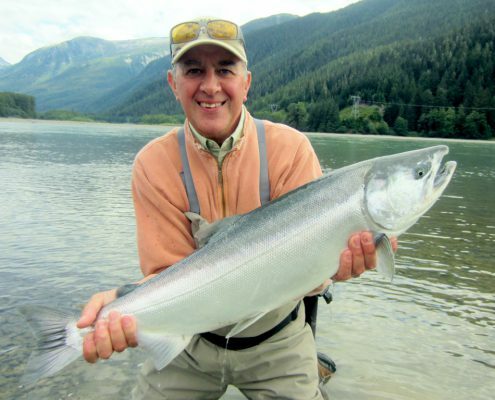 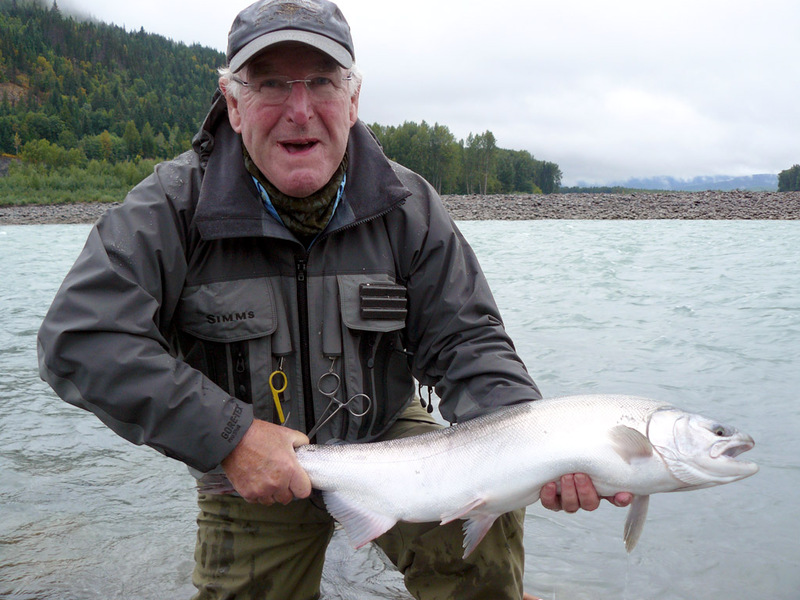 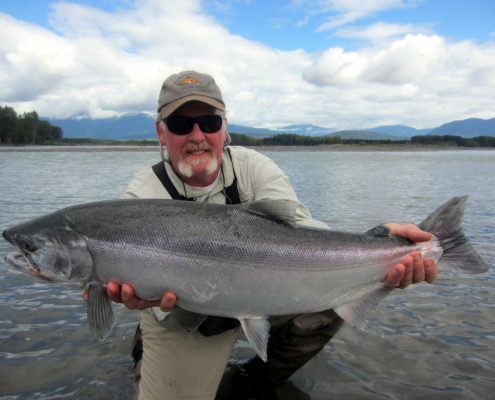 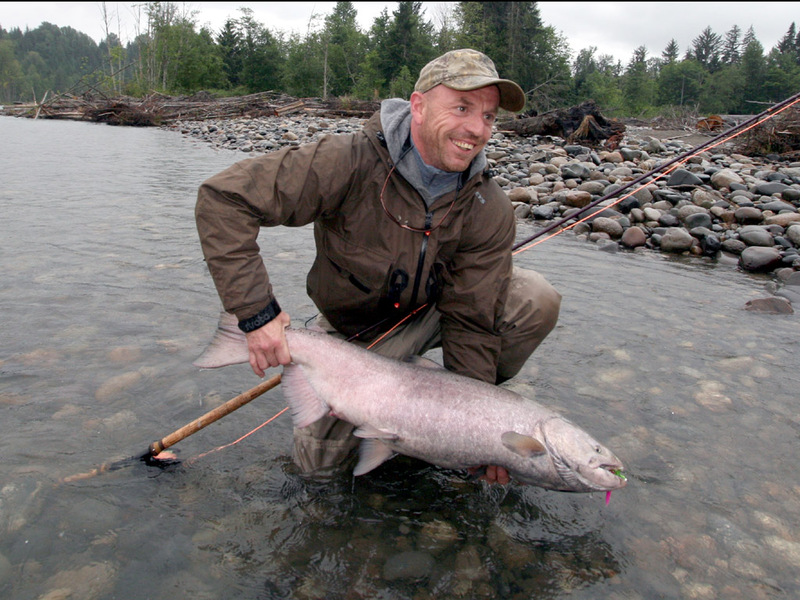 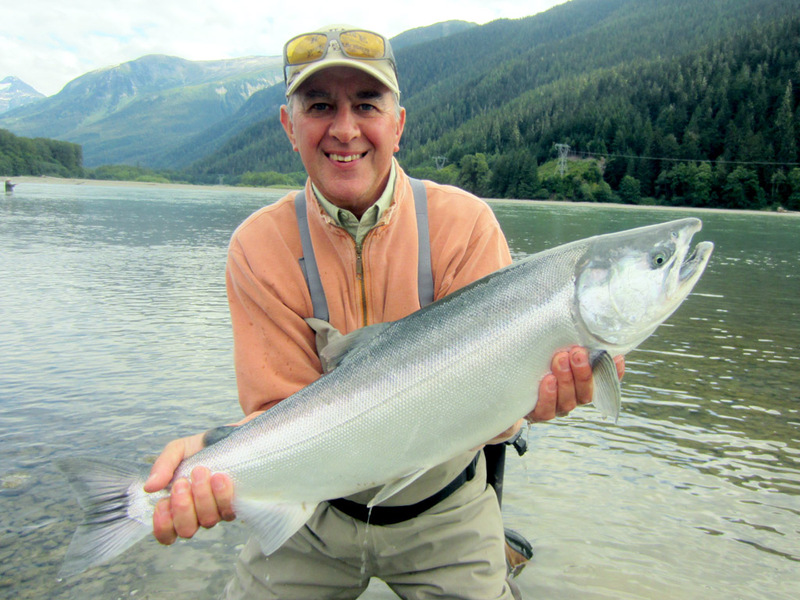 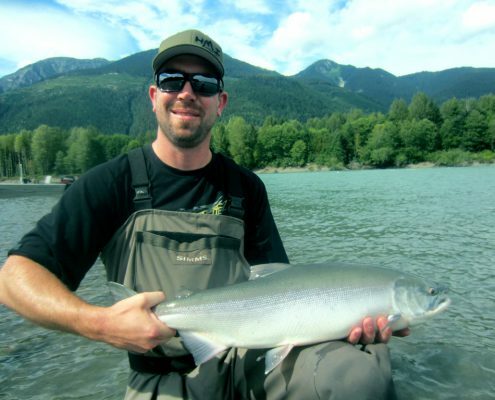 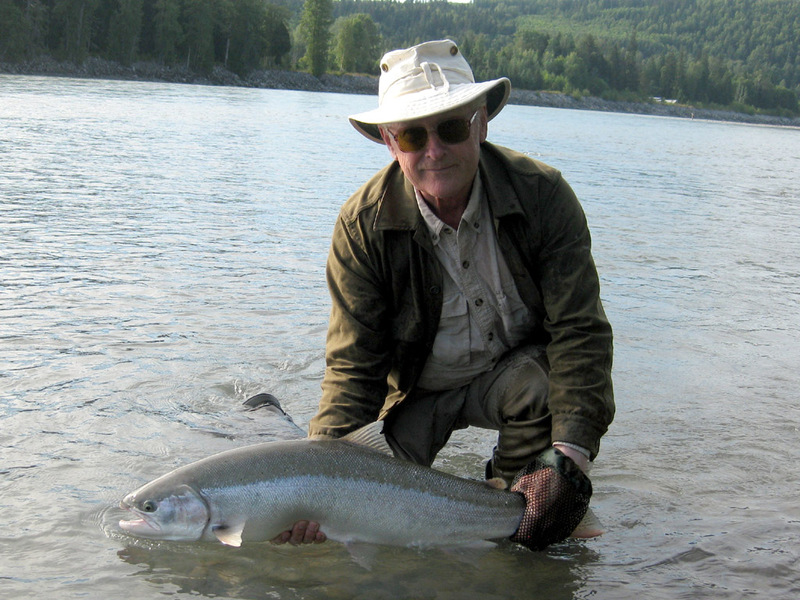 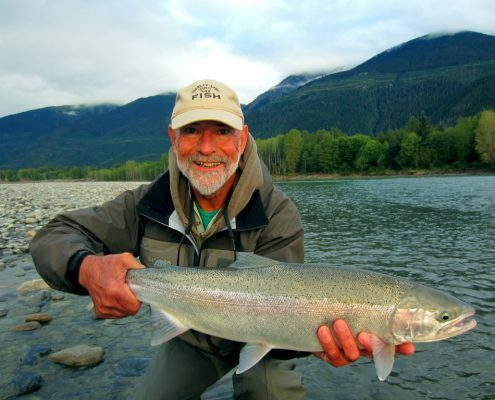 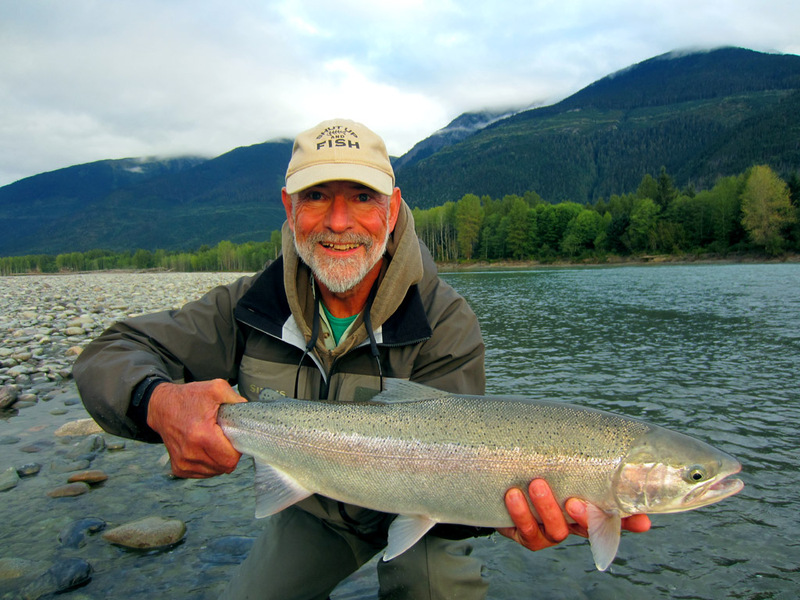 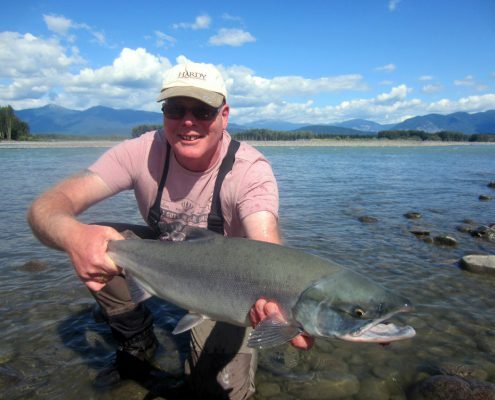 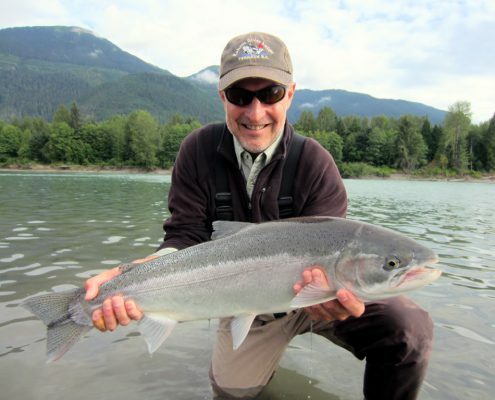 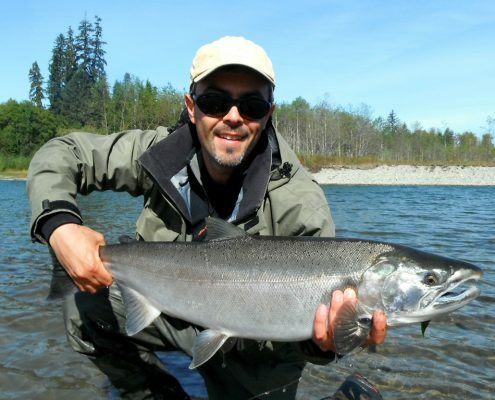 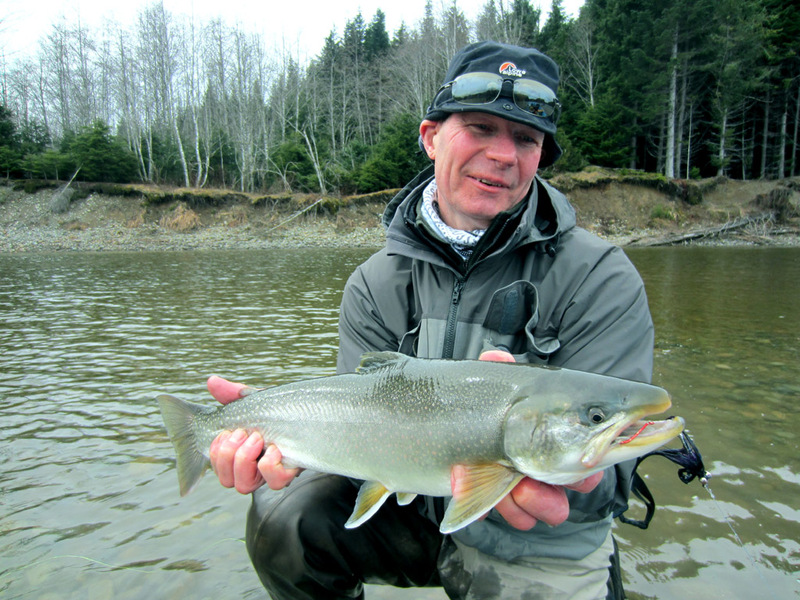 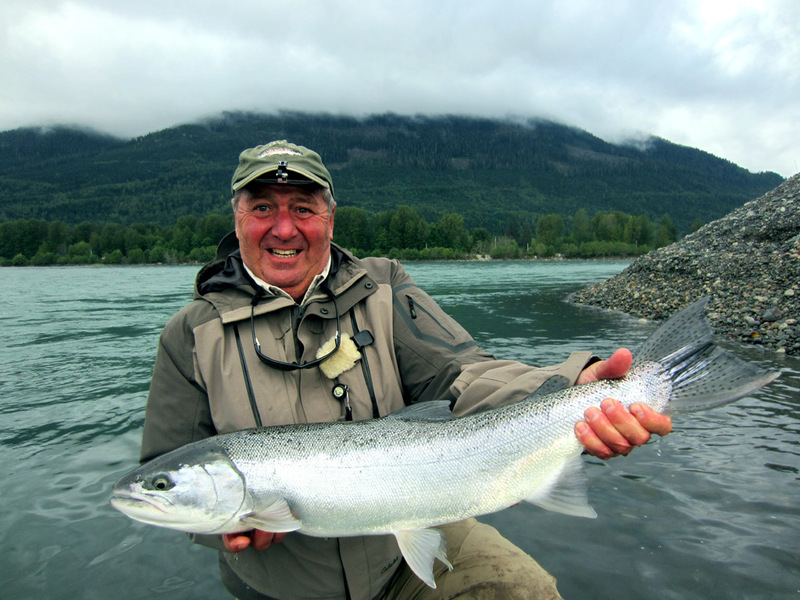 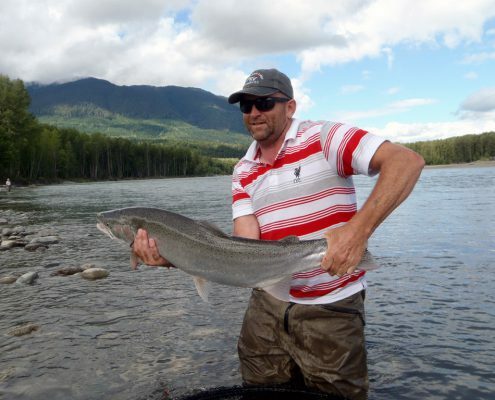 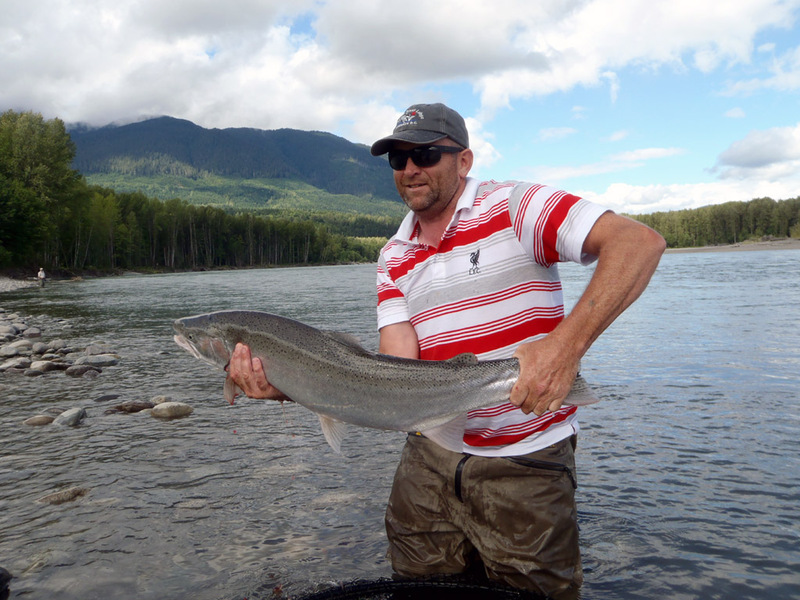 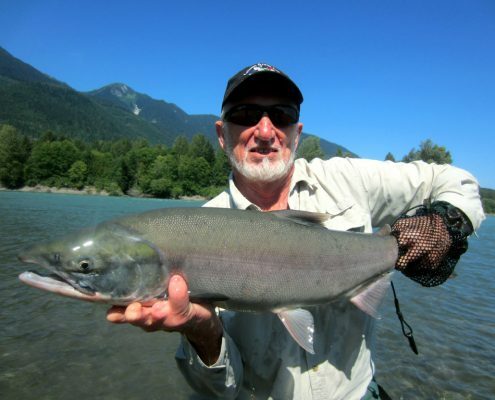 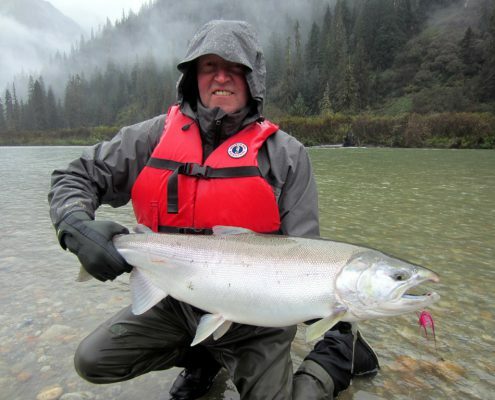 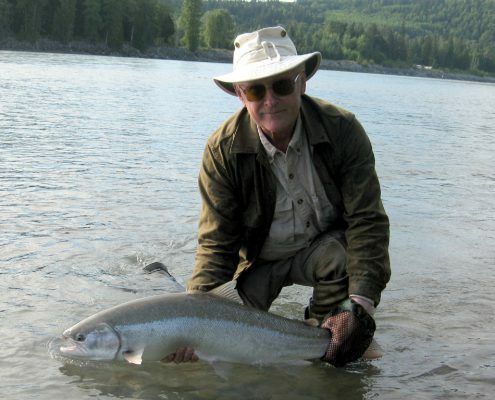 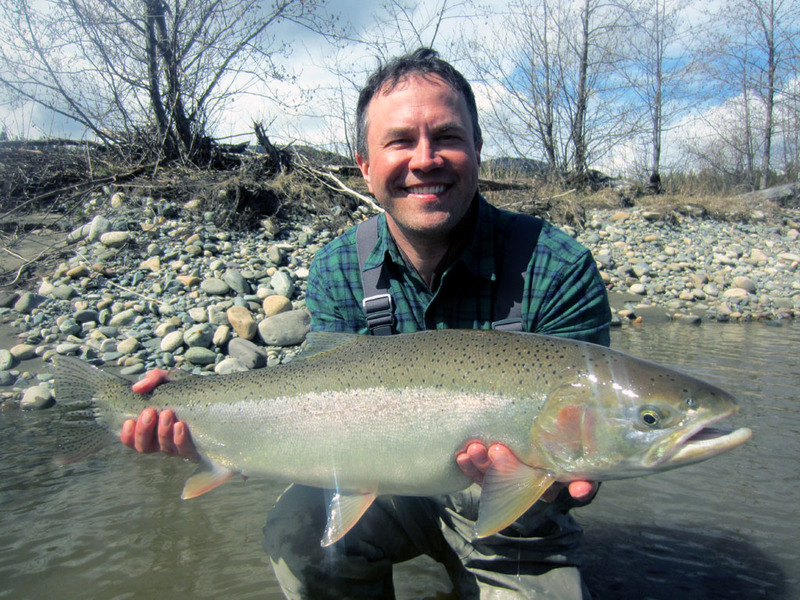 Marc landed this silver beauty on the Kitimat. 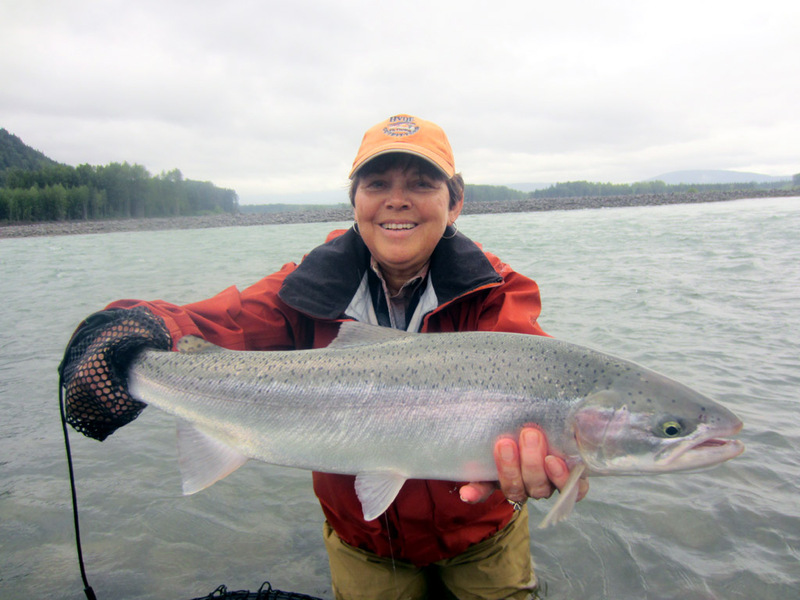 Lodge Manager Deanna Taylor got a chance to go out fishing this week and enjoyed catching some nice Chinook salmon. 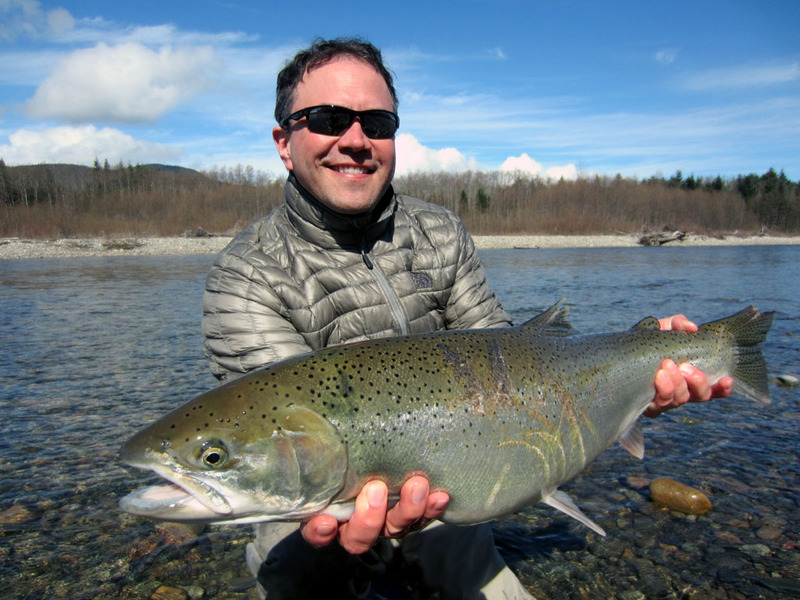 Our summer season is well underway and with new anglers arriving this week, our guides are looking forward to being out on the rivers every day. 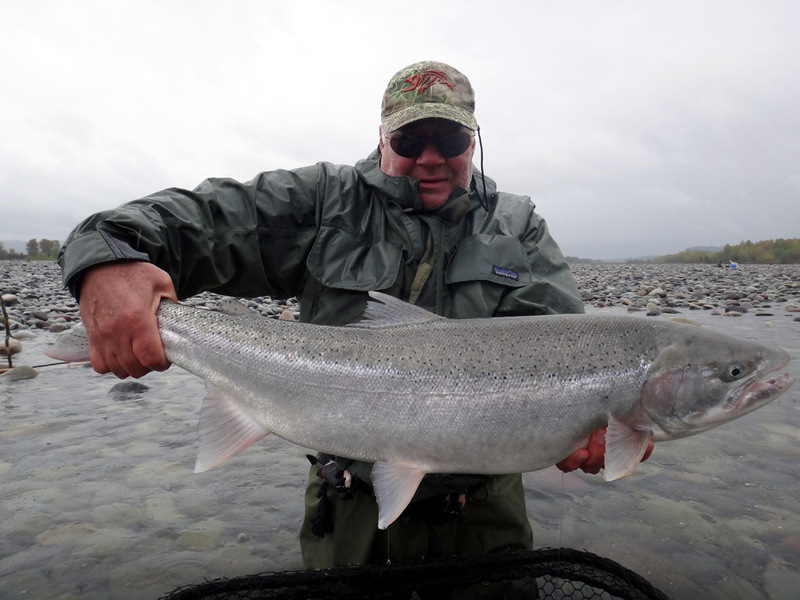 Chinook season is under way!! 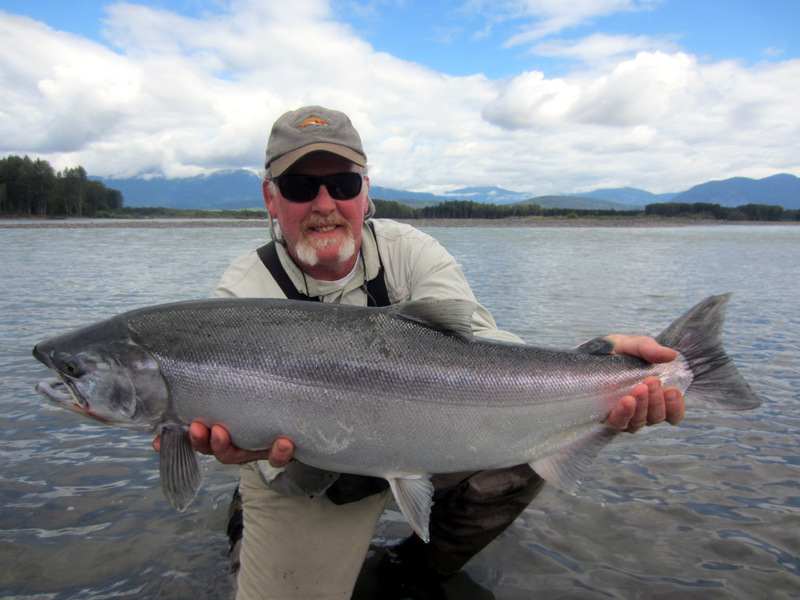 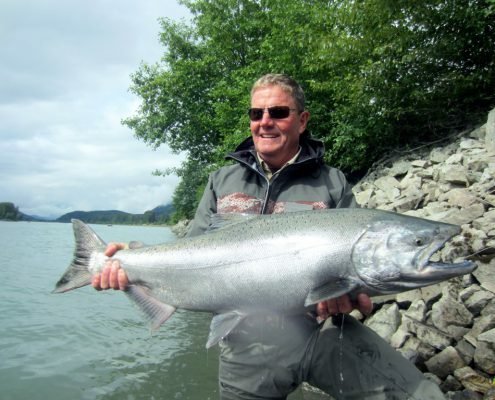 Good early season conditions are providing Kalum River Lodge guests with some excellent Chinook fishing. 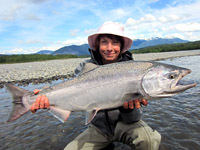 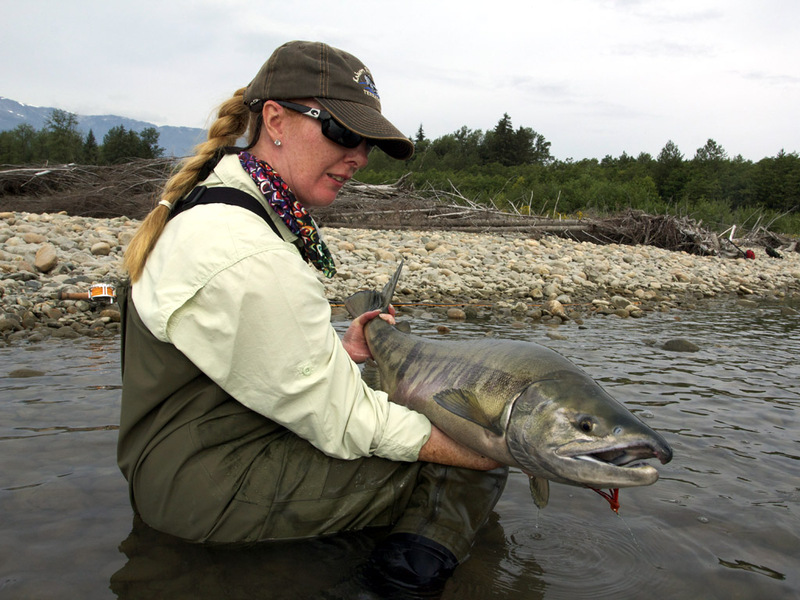 First time angler Elaine from the UK was thrilled to catch a super Chinook salmon. 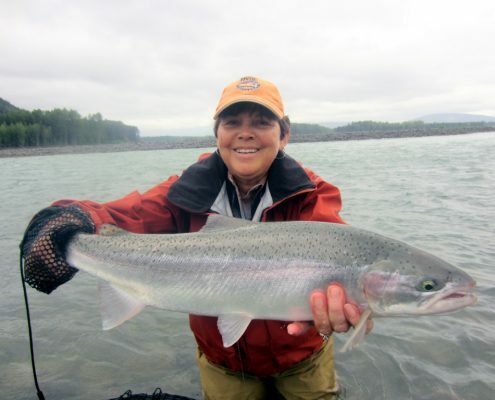 Elaine is already planning on returning next year and says she now understands why so many anglers travel here from all over the world to go after these amazing fish. 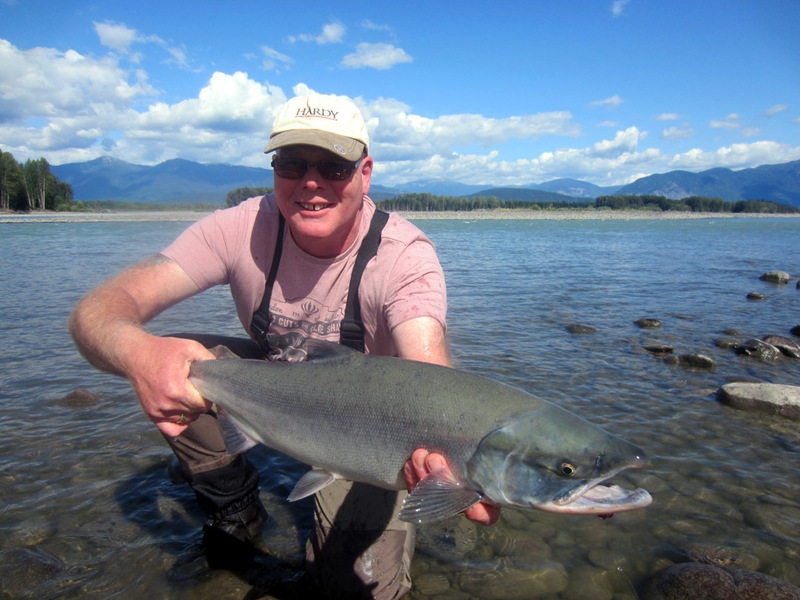 After catching a fish of a lifetime on a previous trip with us, Alan was back into action and landed a nice Chinook on his first day out on the river. 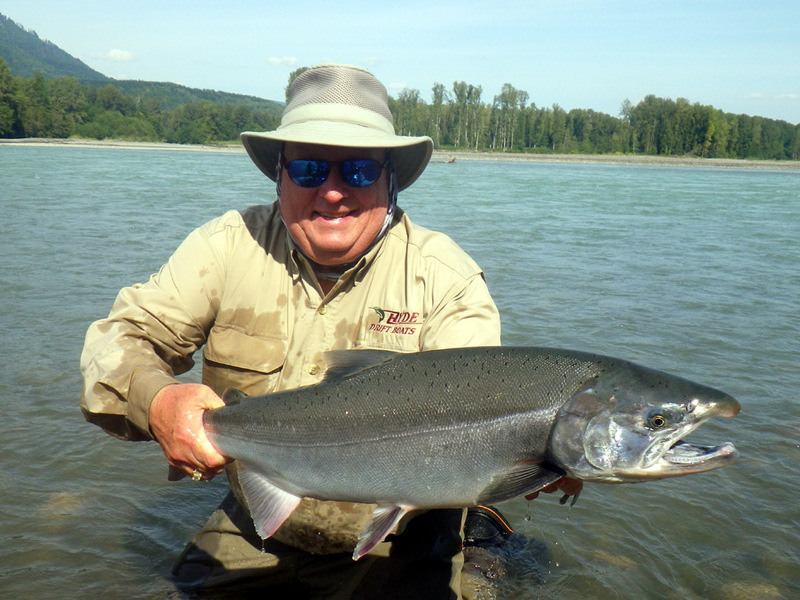 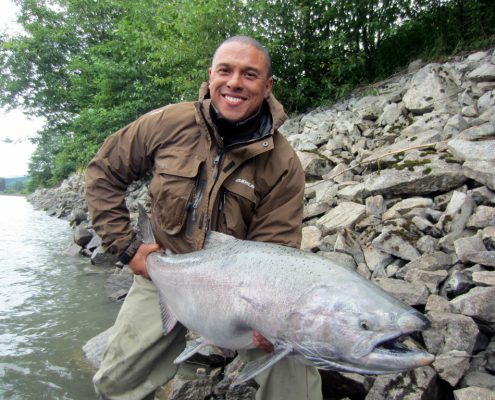 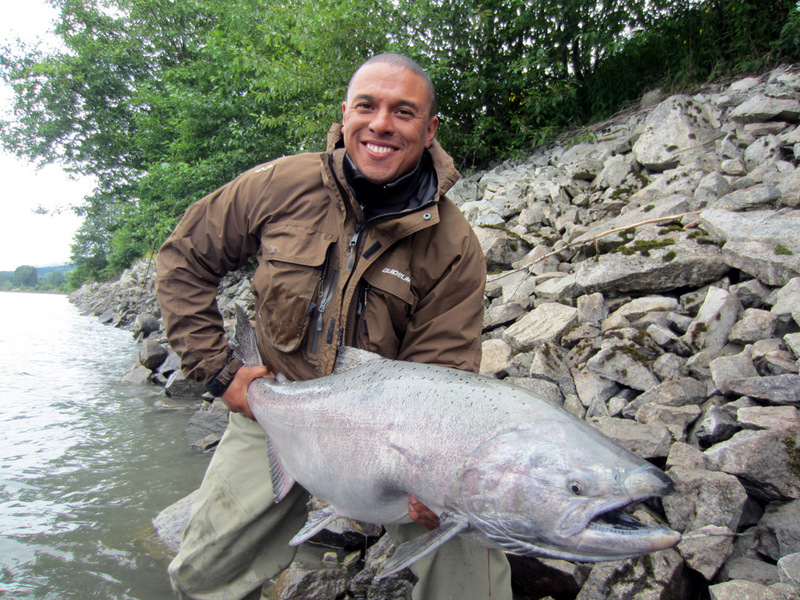 It is now prime time for Chinook and we are looking forward to the upcoming weeks fishing for these monster salmon. 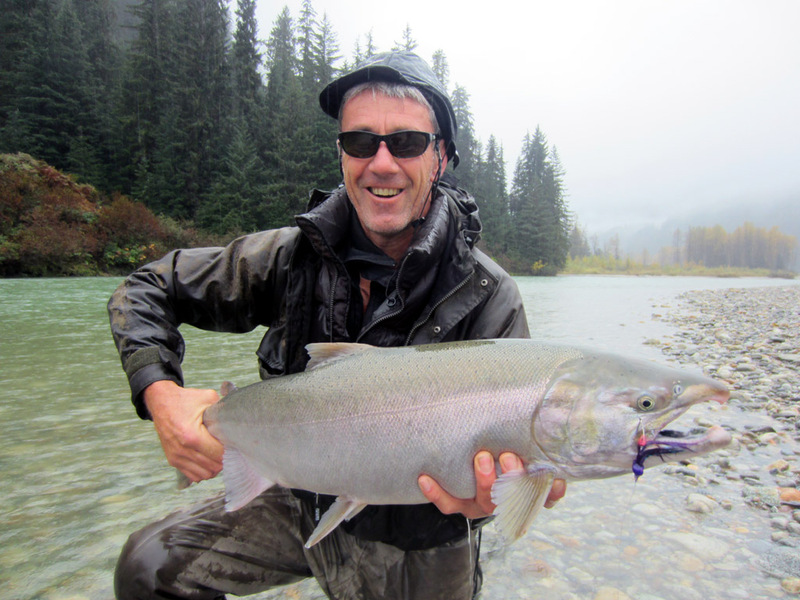 Kalum River Lodge would like to thank Thomas and Andreas for a super week. 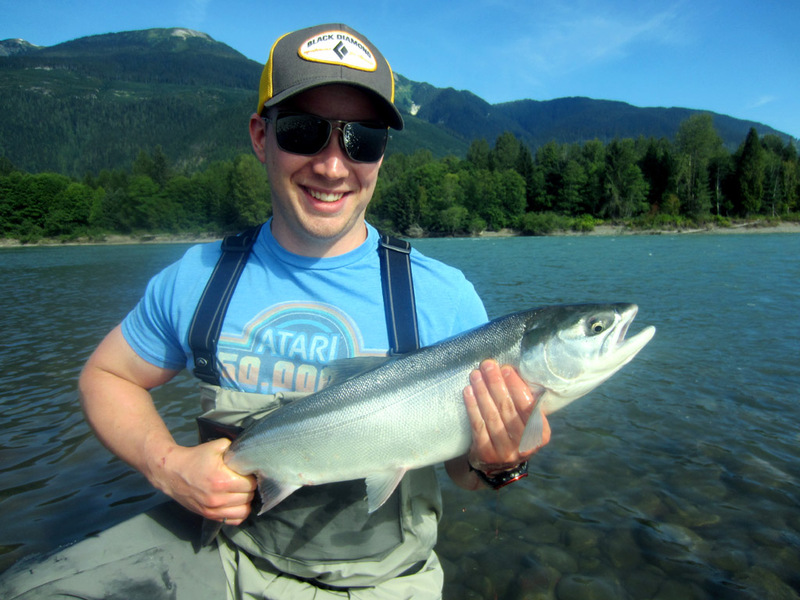 With bright sunshine all week the guys worked hard to get their fish but they enjoyed every minute of it. 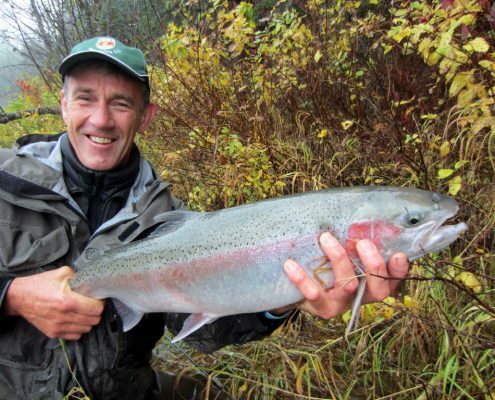 As you can see from the photos they caught a few beauties. 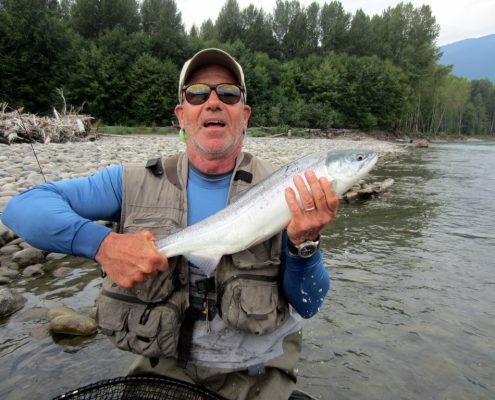 Not only are the guys excellent fishermen but after they prepared a special German potato salad for all of us one evening, we have to say they are pretty excellent chefs as well! 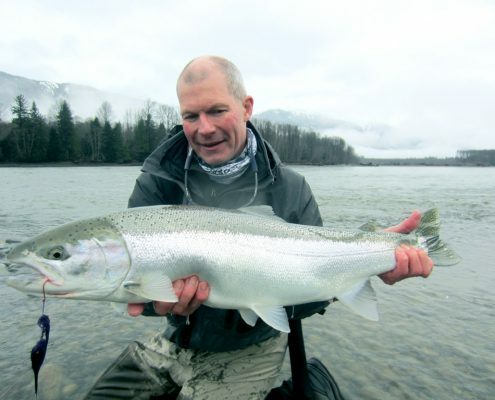 We are already looking forward to their next visit (and the next sampling of German cuisine). 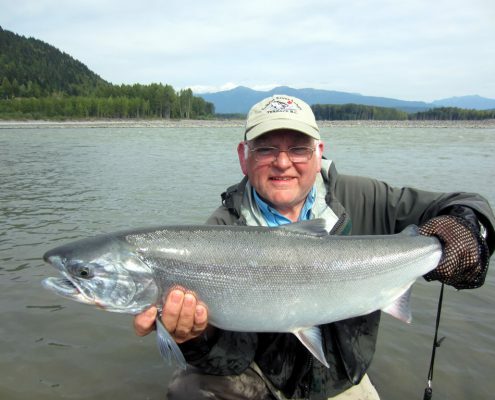 With the warmer spring temperatures and good fishing action, it is easy to understand why many of our guests continue to return at this time of the year. 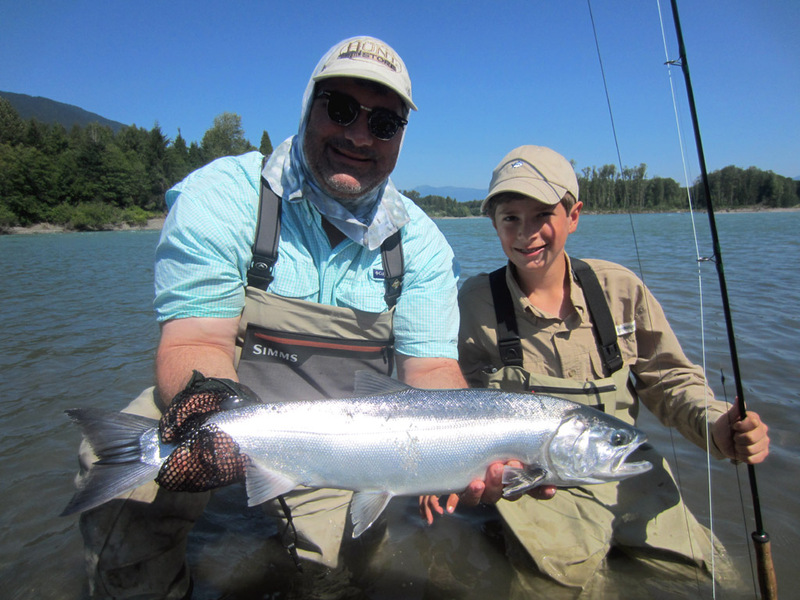 Long time guest Karl Ernst was here with his son Mike to join us again for some spring Steelheading. 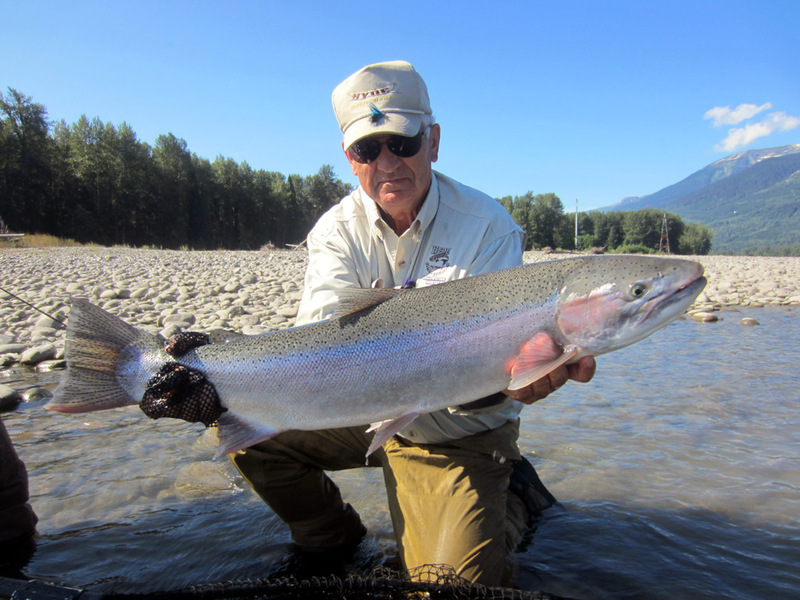 As always Karl left with some great memories for both him and us, as well as some memorable fights with some feisty spring Steelhead. 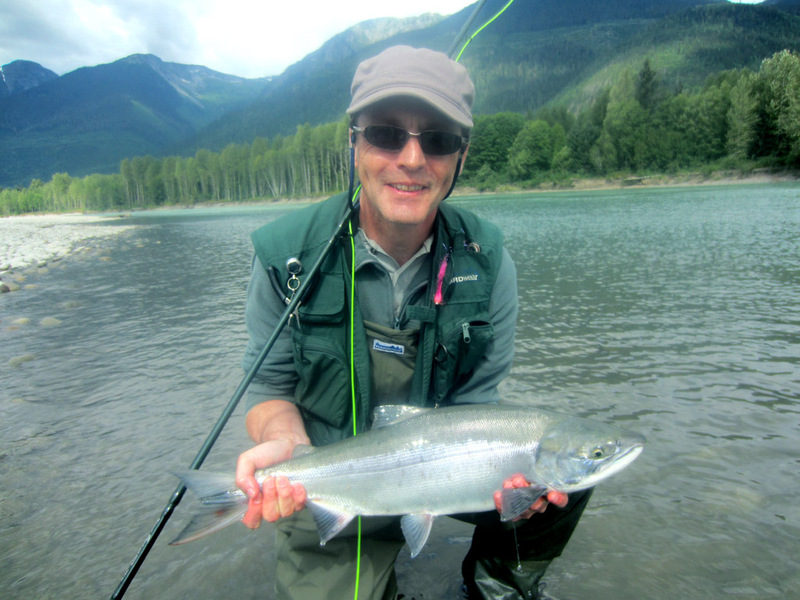 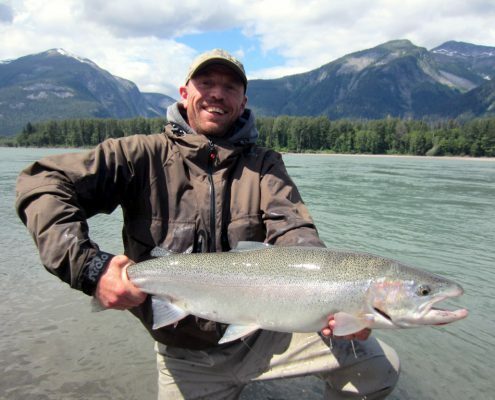 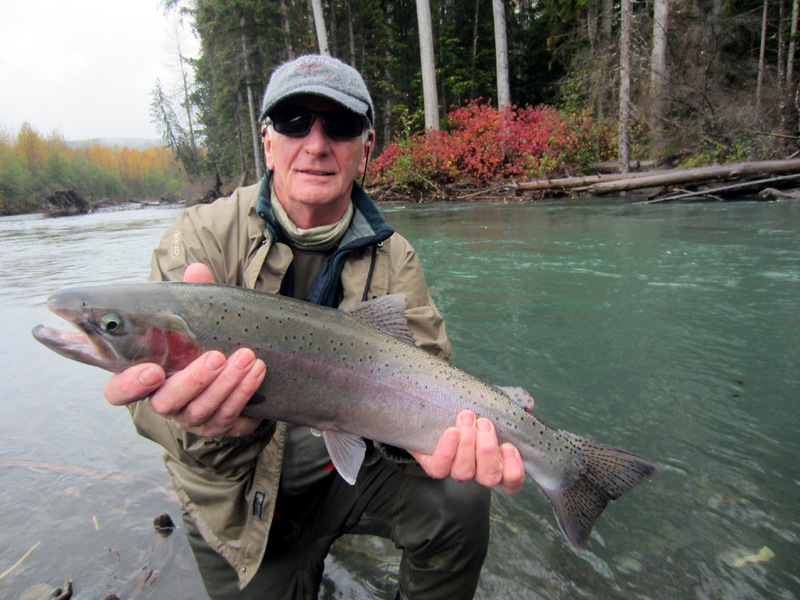 Stephen was our first guest of the season and he landed his first ever Skeena River Steelhead. 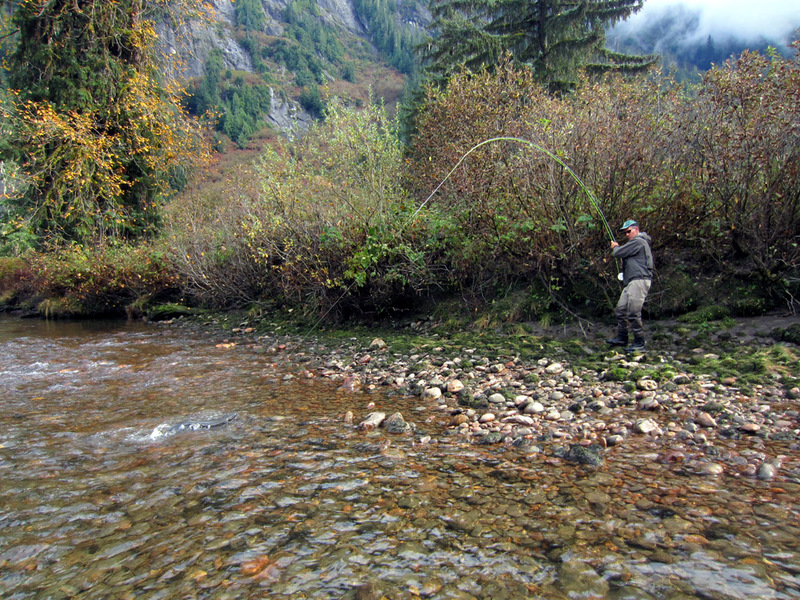 During the week we fished three different rivers and also had some good trout fishing. 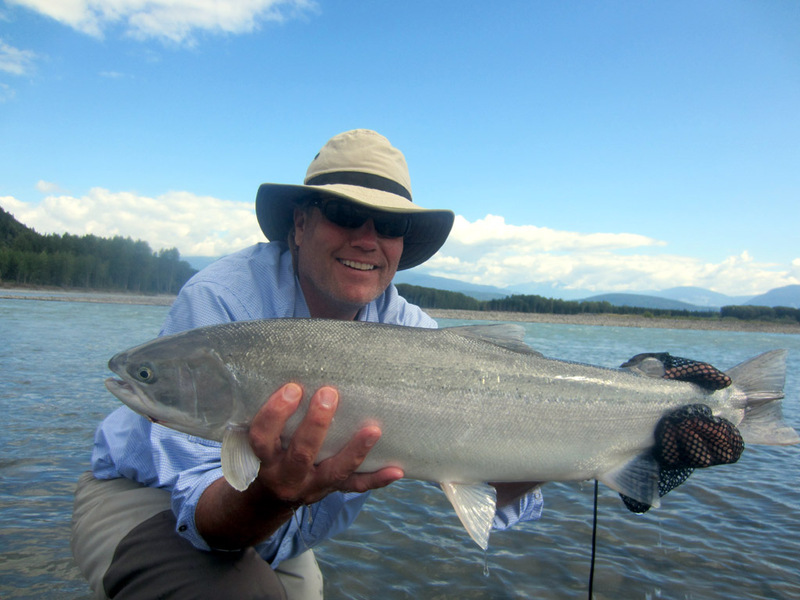 It is great to be back on the rivers to chase after bright silver freshly run Steelhead, lively trout and some early run Chinook salmon. 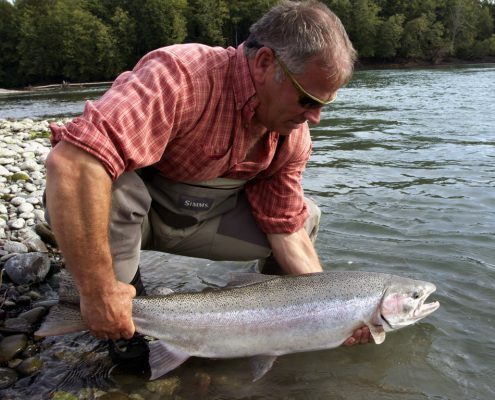 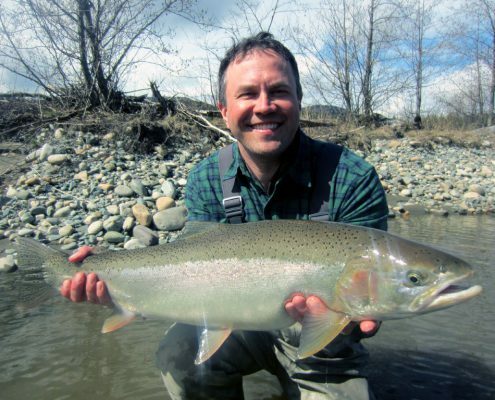 Spring is a great time of year to be here Steelhead fishing. 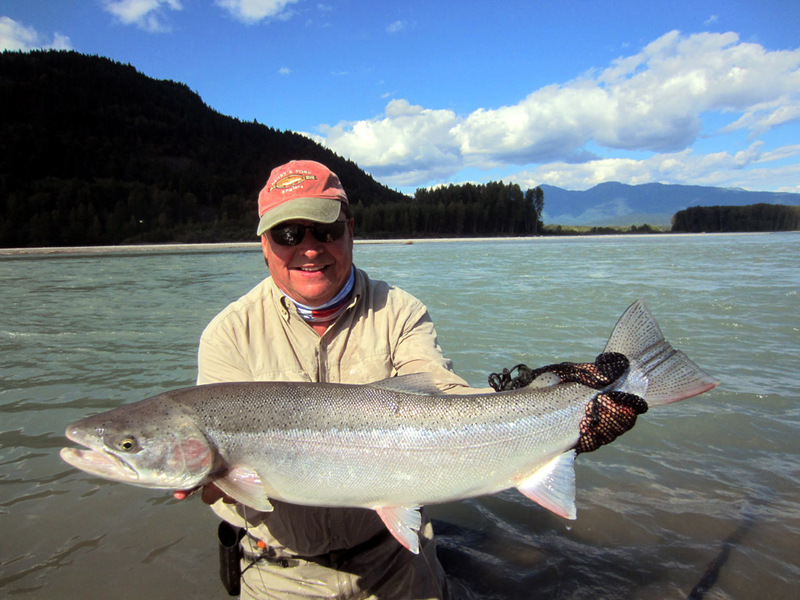 As well as Steelhead there are a few early season Chinook salmon to add to the excitement. 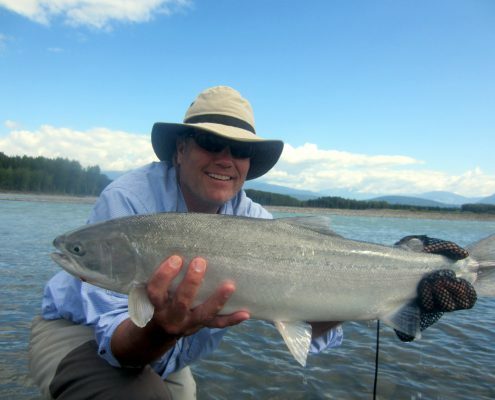 With several superb rivers to fish our guests can experience a variety of waters and some super fishing. 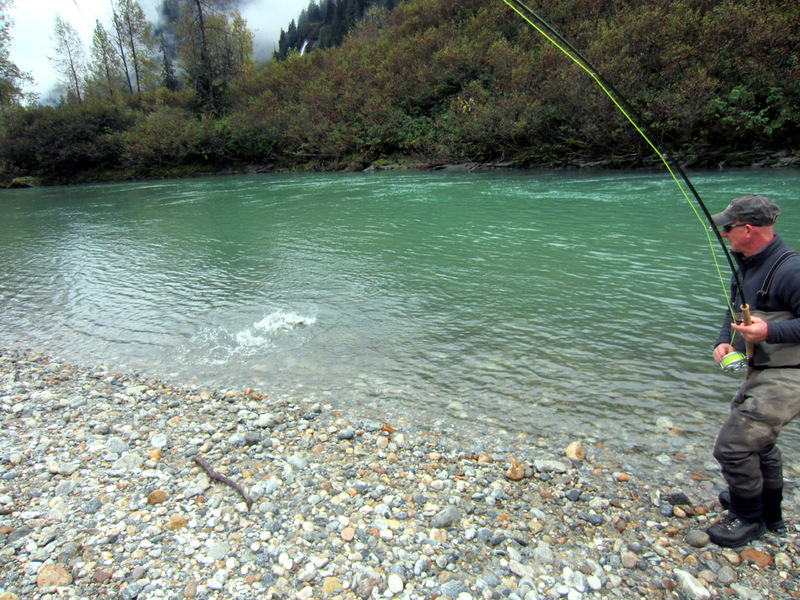 Trygg joined us for three days and enjoyed catching some nice Steelhead, Dolly Varden and Cutthroat trout.